Jordan, the country land-locked between Iraq in the north-east, Saudi Arabia in the east, Israel in the west and Syria in the north is due to its geological location under threat of ISIS that is wreaking havoc in parts of Iraq and Syria. 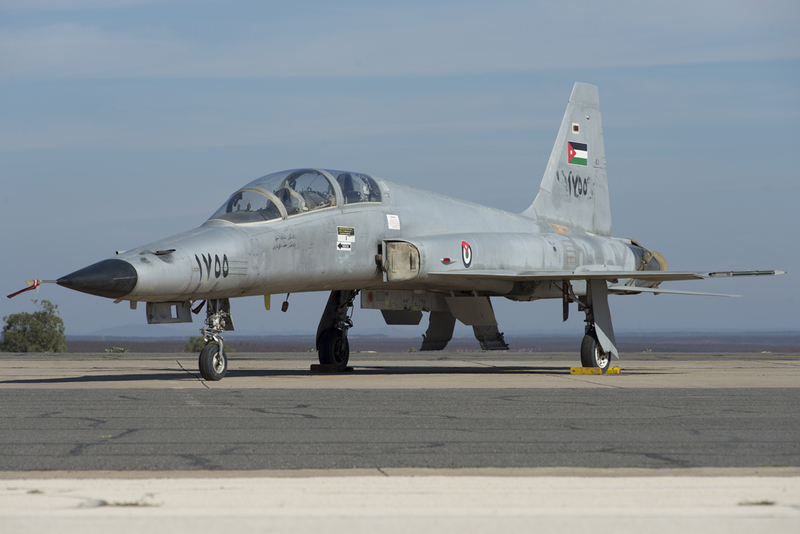 A very good reason for the Royal Jordanian Air Force (RJAF) to invest in both troops and equipment, investments that lead to an air force that is in a state of rapid development. High time to catch up with them, which is what Marco Dijkshoorn and Patrick Roegies will do. 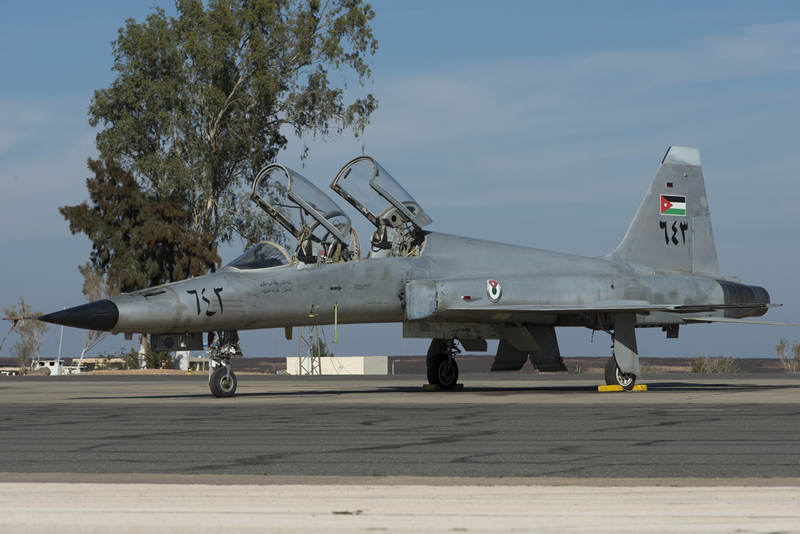 In an exclusive interview with RJAF Commander Major General Mansour S. Aljobour, the developments of the RJAF and the fight against ISIS were the main topics to discuss. 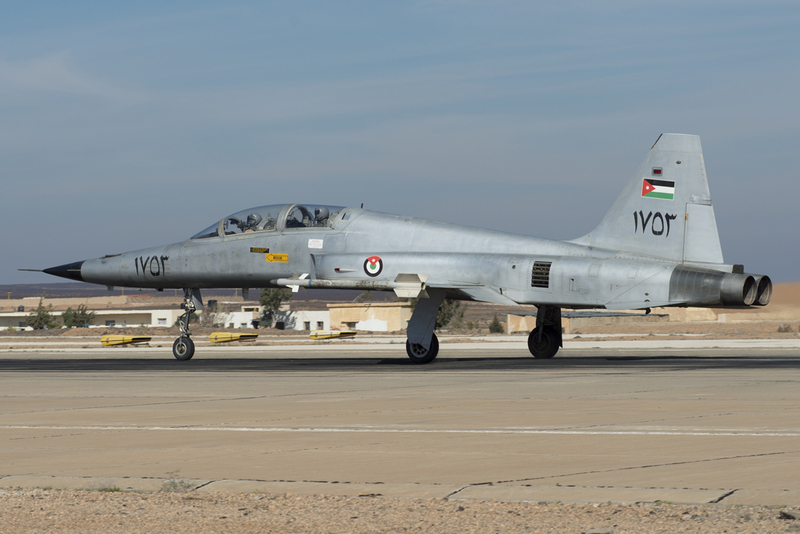 Major General Mansour S. Aljobour is the Royal Jordanian Air Force Commander, He has held this post since the 11th of December 2013. 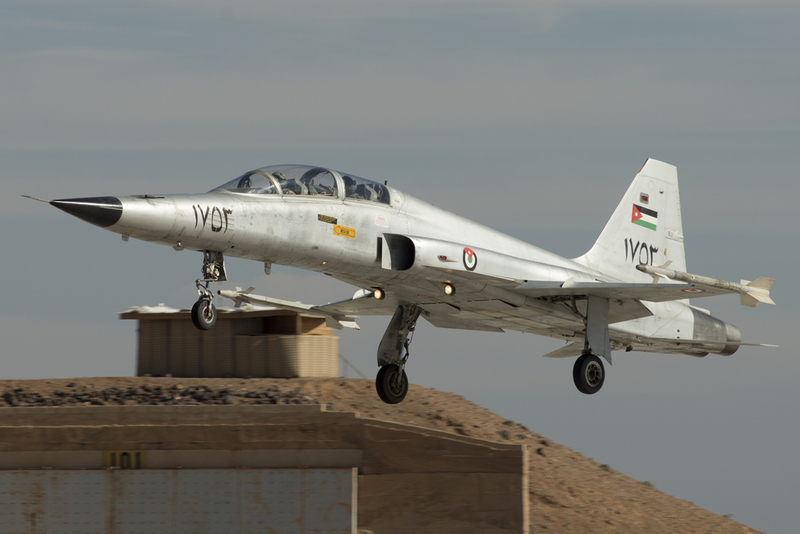 General Aljobour attended the Royal Jordanian Air Force Academy and graduated in 1977. He also attended the RAF command and Staff College in 1992 and the United States Air Force Air War College in 2003. 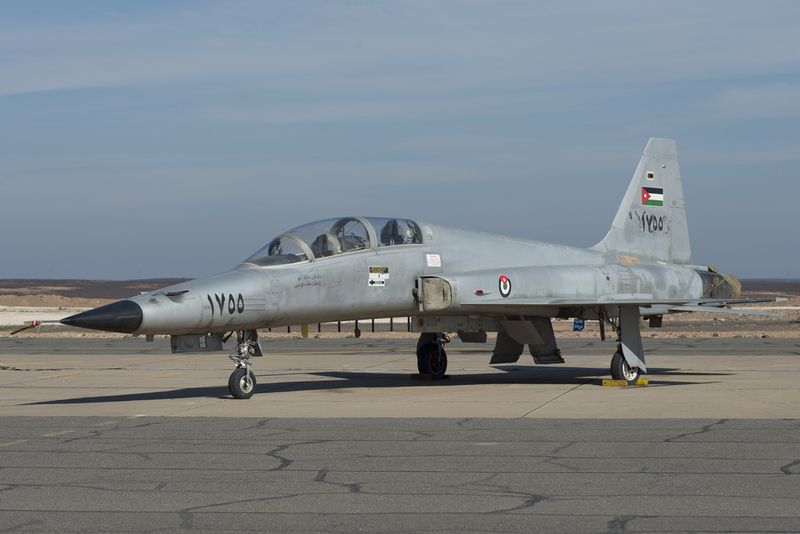 He has served as the Commander of Prince Hassan Air Force Base, the Commandant of King Hussein Air College, the Director of Training and the Director of Operations. 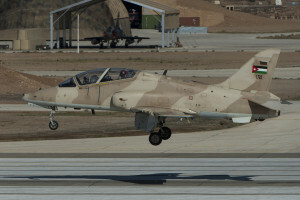 Prior to assuming his current position, Maj. Gen. Aljobour was the Assistant to RJAF Commander for Operations and Air Defense. 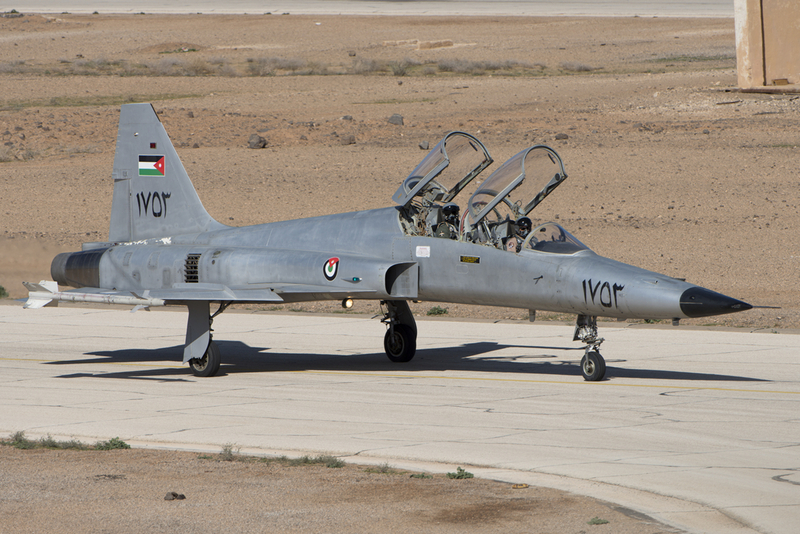 Major General Aljobour is a command pilot with more than 4.500 flying hours in a variety of aircraft. In 1977 earned his flying wings from King Hussein Air Academy. 1986 completed Squadron Officer School at King Hussein Air Academy. 1992 completed Command and Staff College, RAF, UK. 2003 completed Air War College, U.S. Air War College, Maxwell, Alabama, USA. 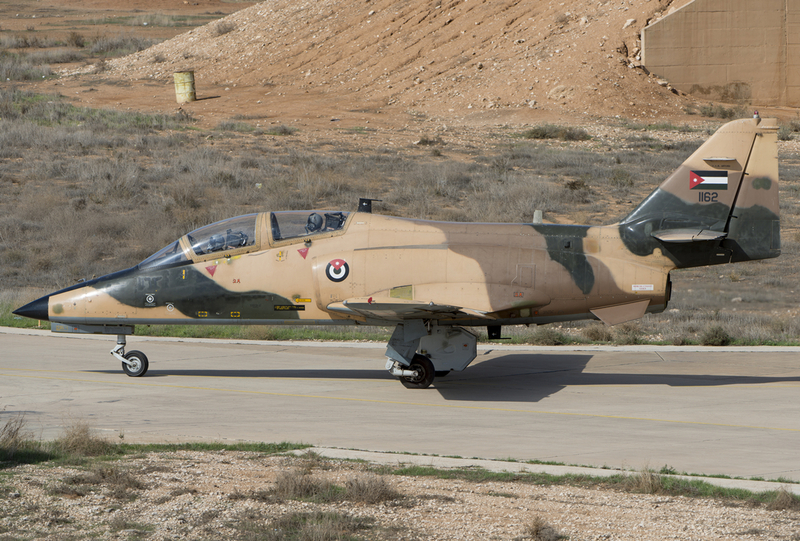 On December 24, 2014 the RJAF entered the headlines when Captain Maaz al-Kassasbeh was shot down during an anti-ISIS strike operation near Raqqah, Syria. His mission was part of a coalition effort against Da’esh (the name now commonly used for ISIS) that was baptized Operation Inherent Resolve (OIR) on October 15, 2014. `Some days after the crash, ISIS posted a propaganda movie online, showing the brutal execution of Captain al-Kassabeh. 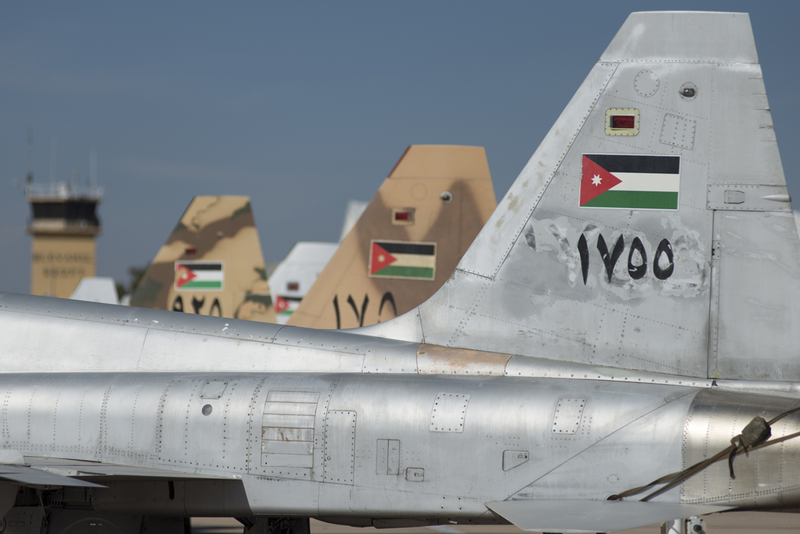 What followed would drastically change the way that Jordan would fight the war against Da’esh. 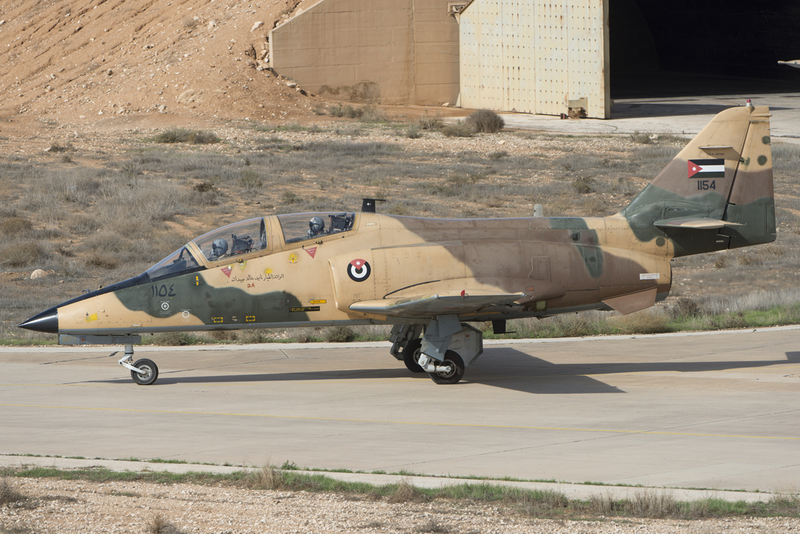 “When we decided to revenge the barbarian execution of our pilot, we flew twenty aircraft for three consecutive days, starting on the 4th of February 2015. At that time we were firing General Purpose Bombs and Laser Guided Bombs. 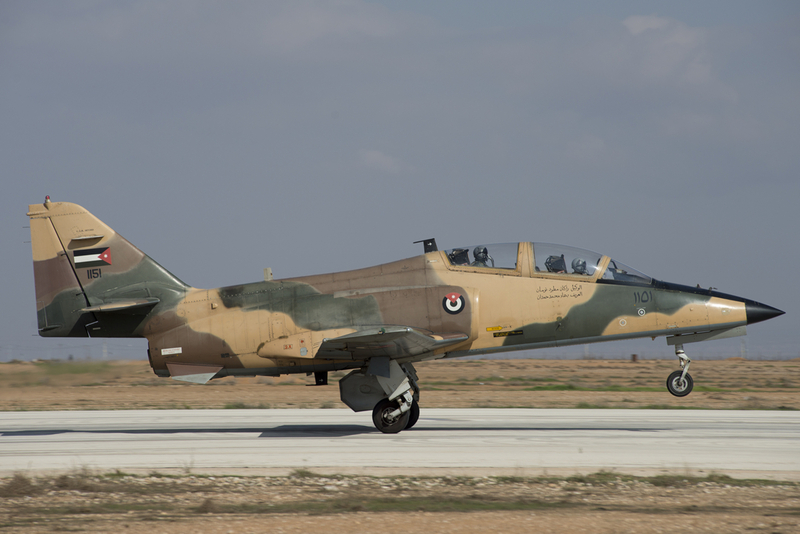 The Battle Damage Assessment showed that we had hit every single target” says a clearly emotional Aljobour. “They are all pushing me on a daily bases to go out and fly. The main focus is over Iraq and Syria and we strongly believe the threat is there. To us and to the region and the International community. We are going to focus, those guys [Da’esh] are not going to be forgotten until they are defeated. Our crosshair is going to be at them for as long as it takes, we will fight them till the last drop of fuel and the last bullet we have”. 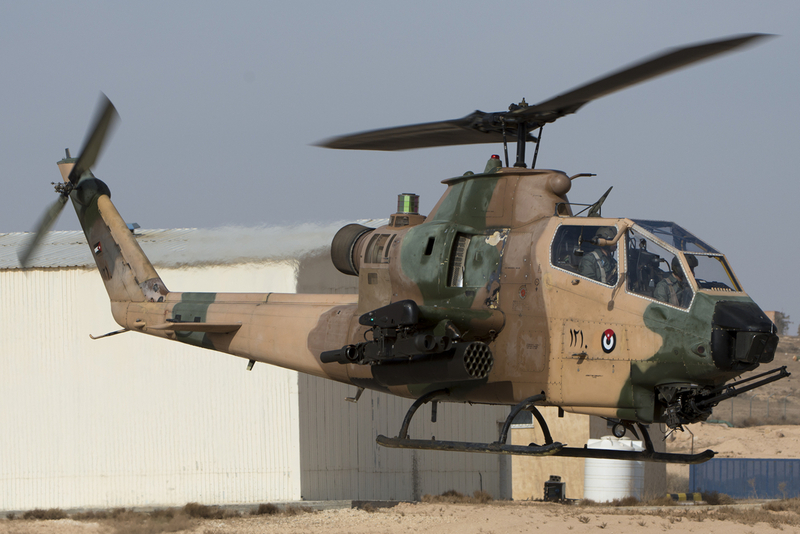 Until now more than 1.100 hours were flown against Da’esh and currently one two-ship mission is flown on a daily basis. 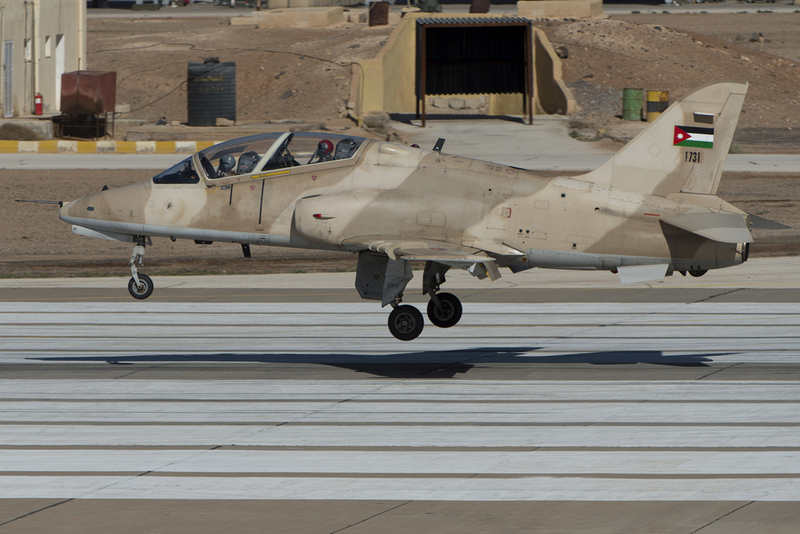 The area of operations for the RJAF is both Syria and Iraq and it is the only Arab country that is allowed to perform kinetic missions over Iraq. 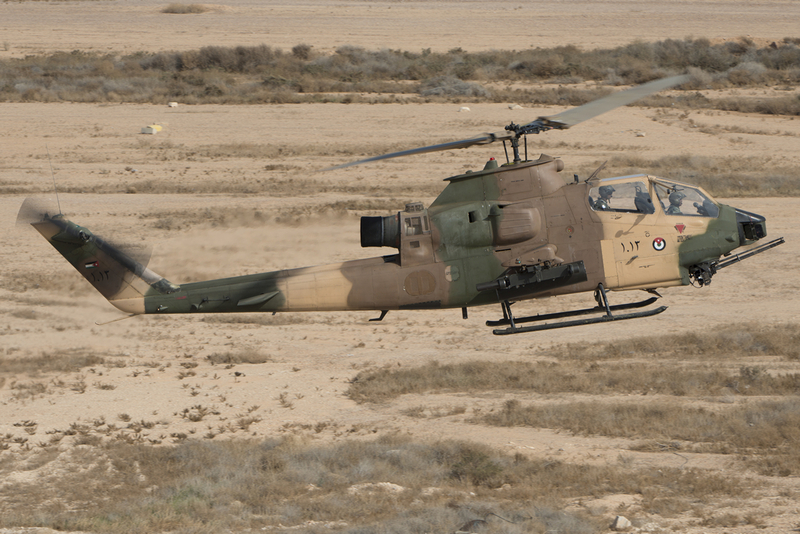 There are no restrictions over Iraq although the US has drawn a line to divide the Area of Operations (AOP). 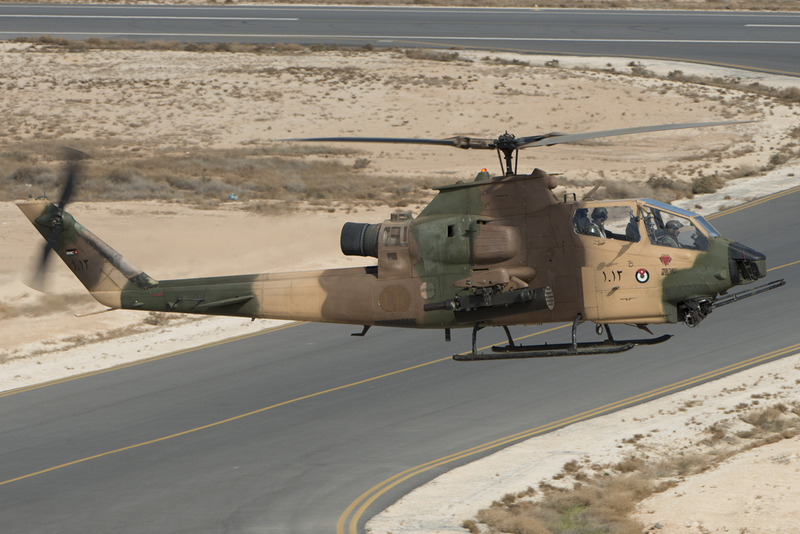 Air Tasking Orders (ATO) are provided by the Combined Air and Space Operations Center (COAC) in Al Udeid, Qatar where a RJAF liaison officer is stationed to relay between the CAOC and the Air Operations Center in Jordan. 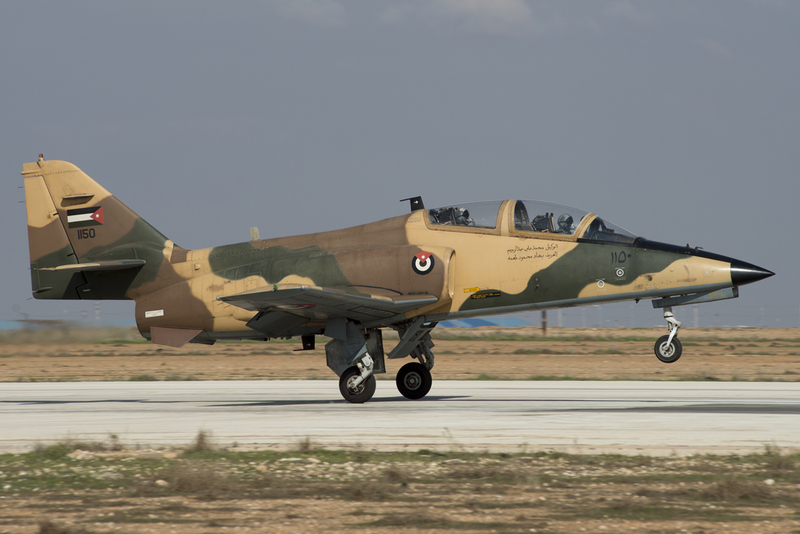 The RJAF is mainly performing operation over Raqqah in central Syria and Deir-ez-Zzor in eastern Syria. Those are the strong-points of Da’esh and that is where the focus is. 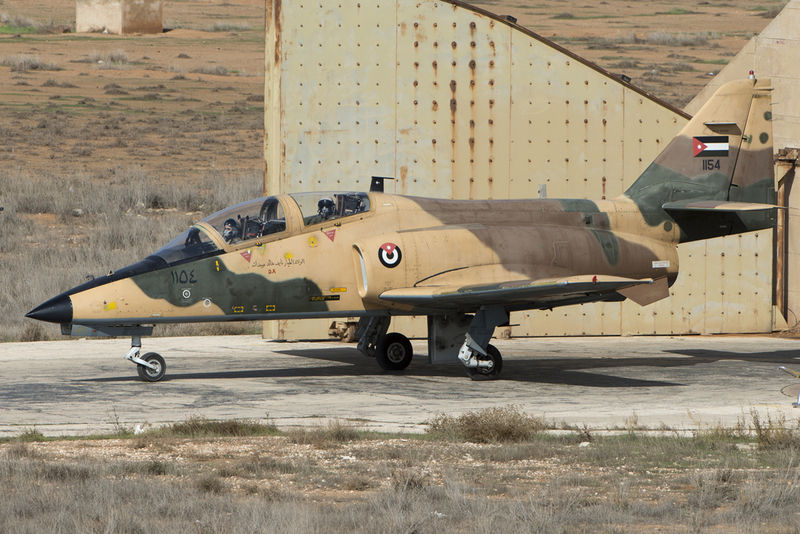 “This is one of the most restrictive air campaigns ever”, says Aljobour “Due to the long distances that need to be crossed and the heavy restrictions that are imposed to avoid collateral damage we fly loiter over the target for a long time before engaging”. 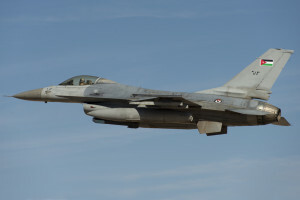 In the current inventory there are 43 F-16AM/BM and the RJAF will receive fifteen additional F-16s from The Royal Netherlands Air Force (RNLAF). 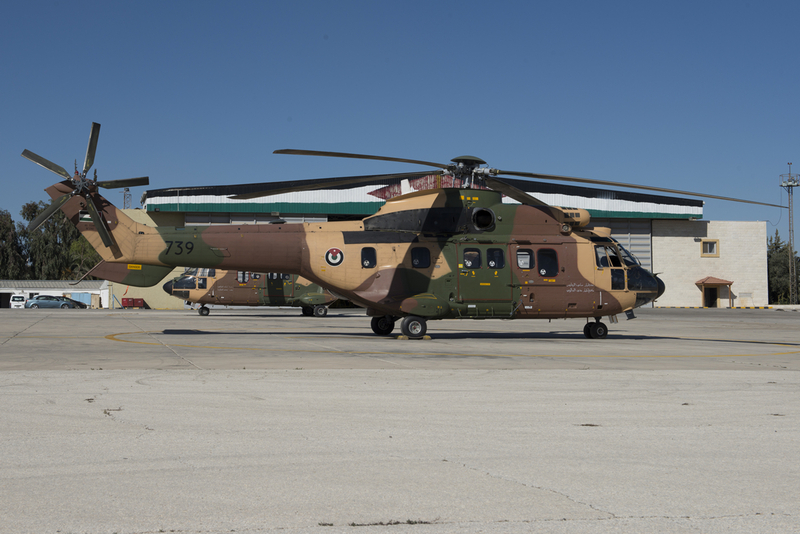 Before they will be delivered to Jordan, they will be upgraded to Mid-Life Update (MLU) Operational Flight Program (OFP) 6.5 code, the latest software-upgrade available in Europe. Under the initial contract OFP version 5.0 was ordered and approved by the U.S. Congress. 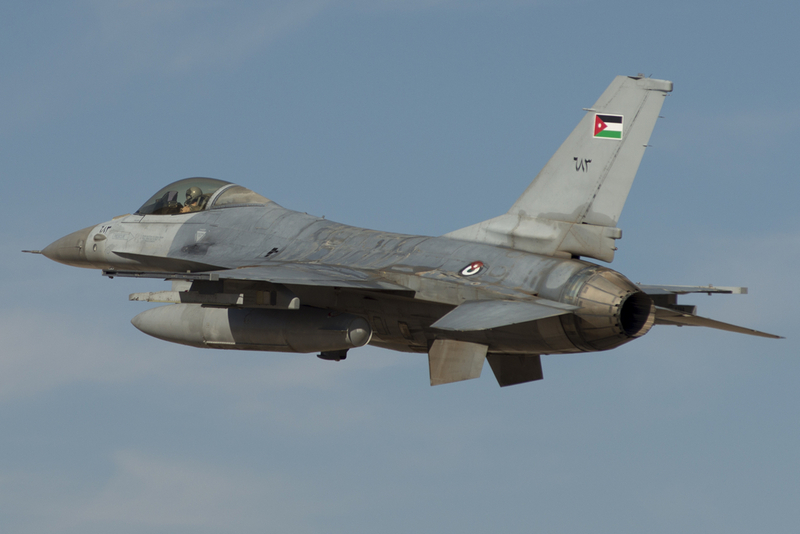 Due to technical difficulties to adapt the OFP 5.0 code to the hardware installed in the Dutch F-16s, a new congressional approval for the release of OFP 6.5 is now pursued. Delivery is scheduled for late 2016, early 2017 and when delivered, the RJAF will sell some of the F-16s in the current inventory. 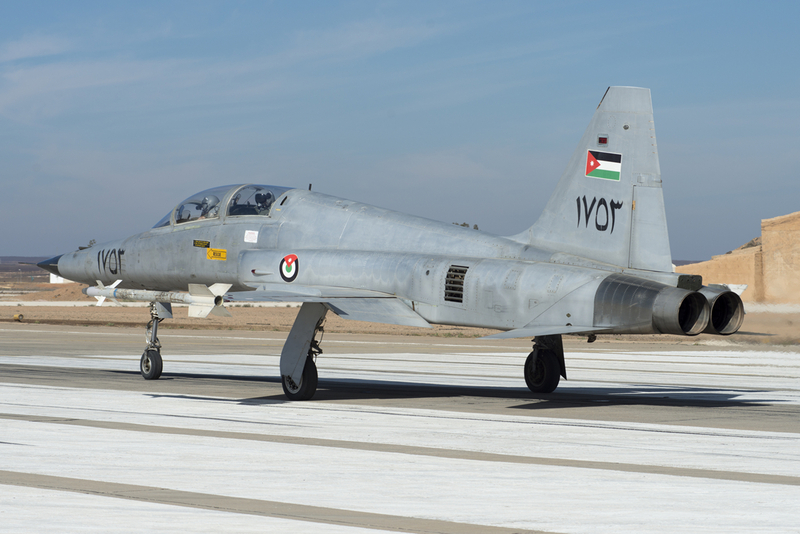 Pakistan, one European and some other country have shown interest in these surplus aircraft and if transferred, it will most probably involve the ex-U.S. Air National Guard Peace Falcon II aircraft that were delivered to Jordan from 2003 onwards. 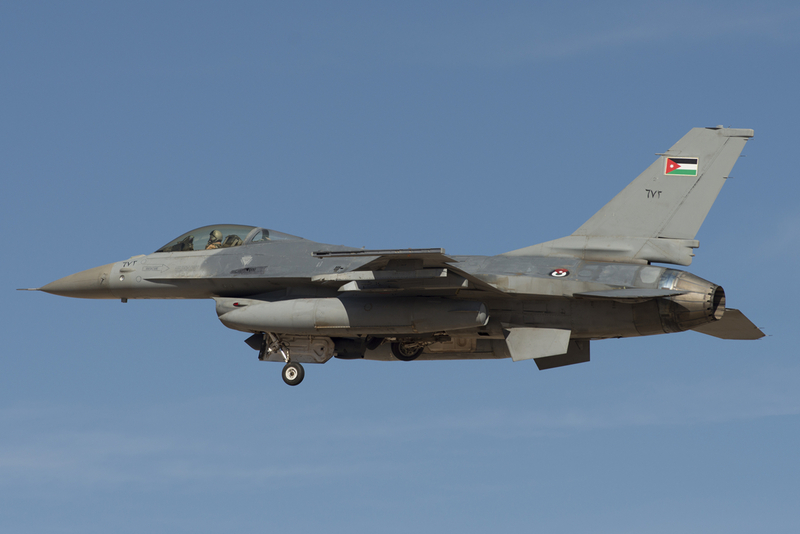 In the meantime an upgrade program that will improve the existing fleet of former Belgian Air Component and RNLAF F-16AM/BM’s in the current inventory to the MLU 6.5 standard will be initiated. 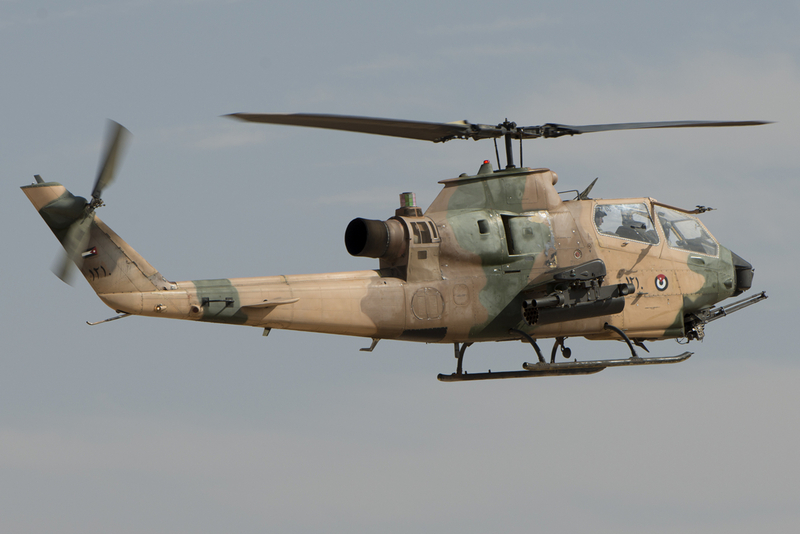 “We also signed a Letter of Acceptance (LOA) for the procurement of JDAM’s and 15 sniper pods that will enhance the fighter’s capability have been purchased”, says General Aljobour. 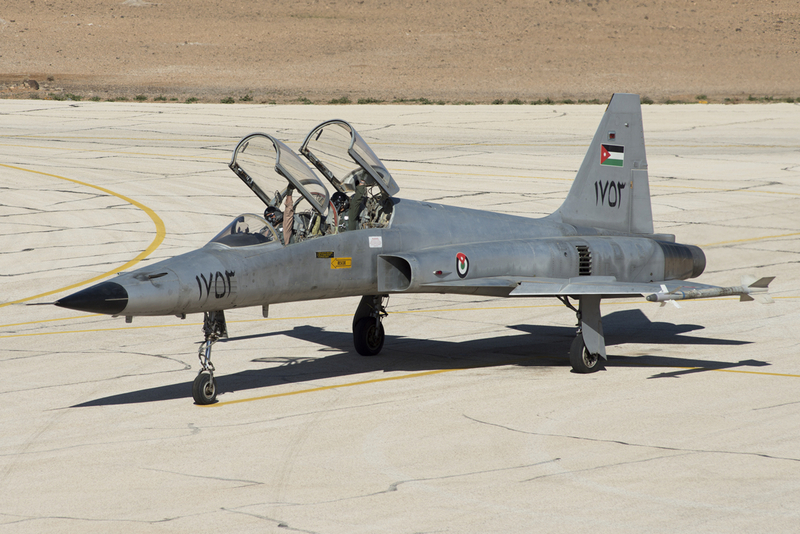 Although the Prince Hashem Bin Abdullah II Royal Aviation Brigade at King Abdullah II Air Base is part of the Royal Jordanian Army, it has very close ties with the RJAF. 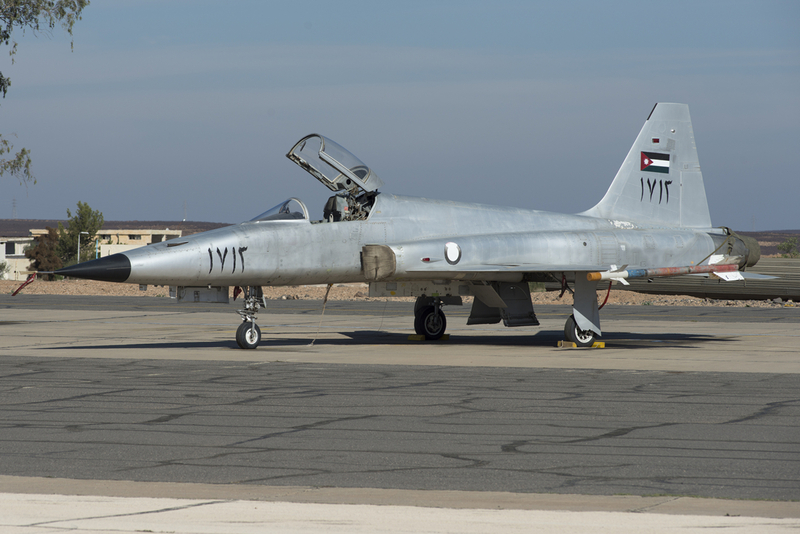 The aircraft are maintained by ex-Air Force personnel and the pilots are all trained by the RJAF King Hussein Air College. 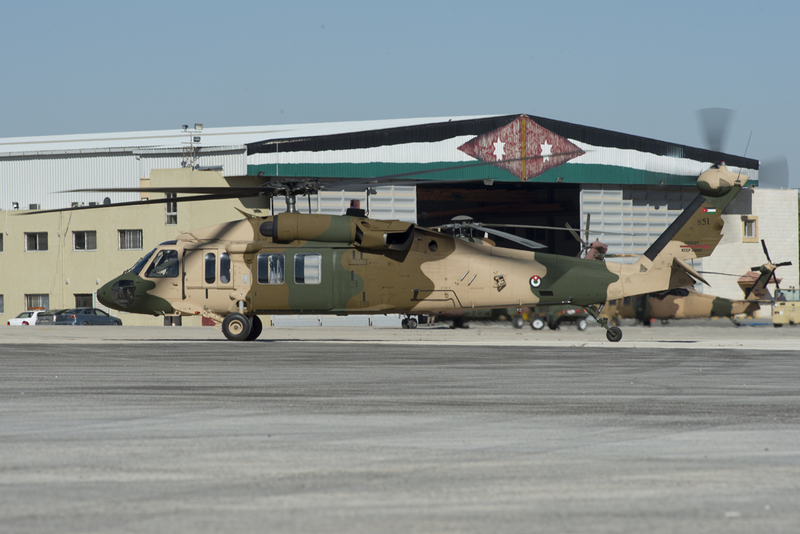 The MD530f “little Bird” and UH-60L Black Hawk helicopters and AC235 gunships are operated by three squadrons that occupy a separate platform adjacent to the tower that is also overlooking the RJAF aircraft stationed at KA2. 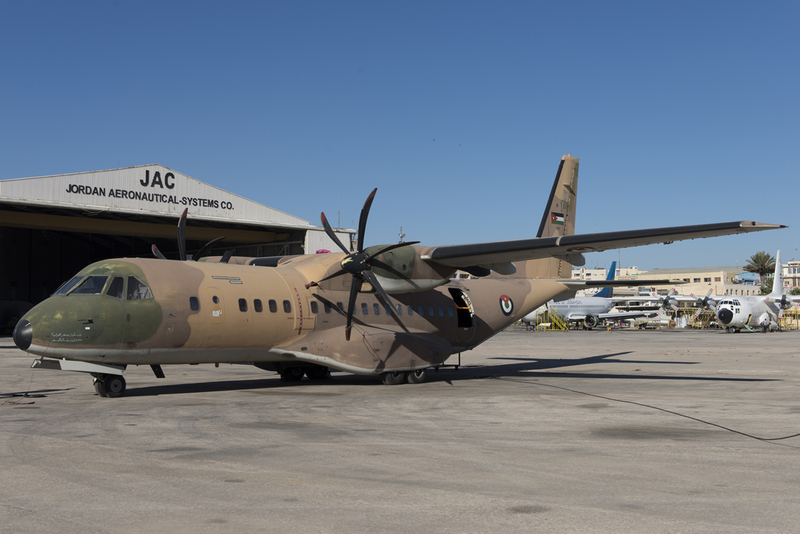 To support Jordan in the fight against Da’esh, the United Arab Emirates (UAE) government supplied six IOMAX light attack AT802 turboprop aircraft to Jordan under a U.S.-backed plan that was executed in 2013. 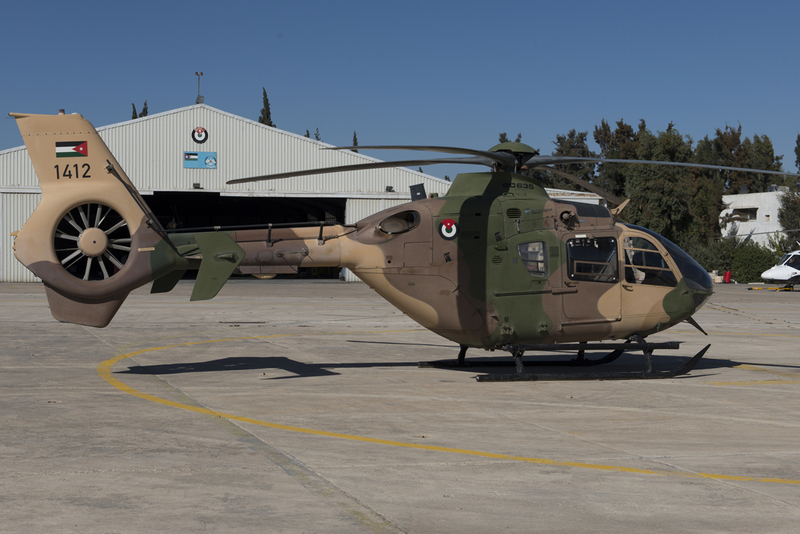 They are operated by 25sq which is dispersed across Amman-Marka and King Abdullah II. 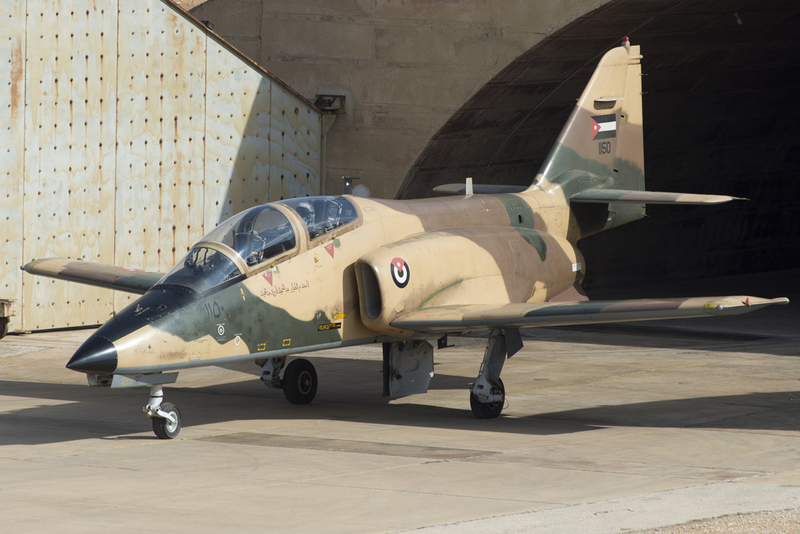 Once there is sufficient space for them at King Abdullah II Air Base, all the Air Tractors will move there. 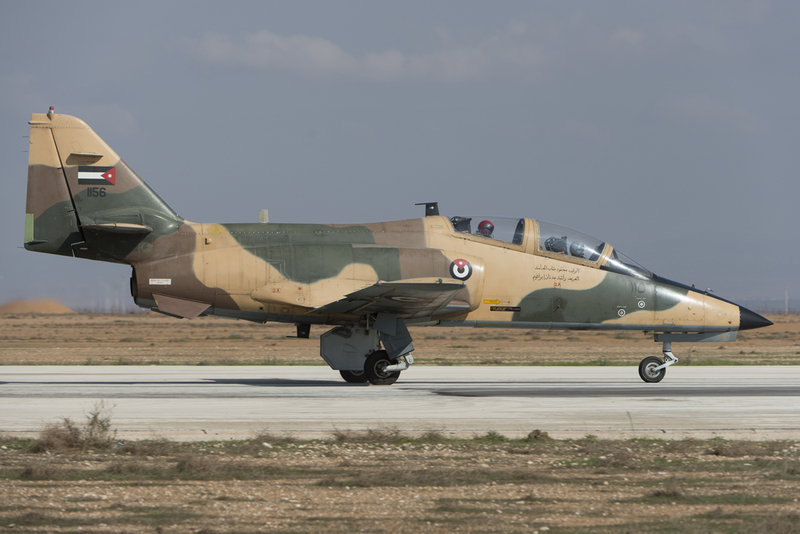 “We have six Air Tractor Block 1 aircraft and we will receive four additional ones. 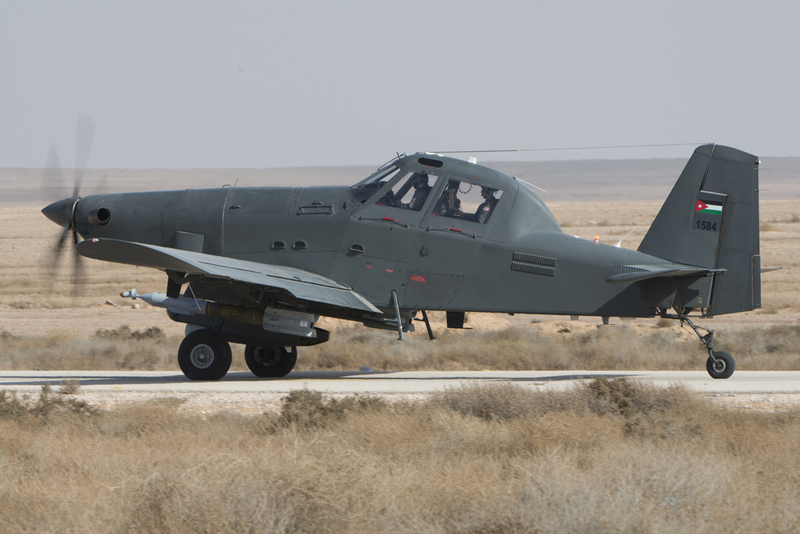 The aircraft will get the Block 3 upgrade, similar to the IOMAX Archangel [based on the Thrush S2R-660 airframe] aircraft. 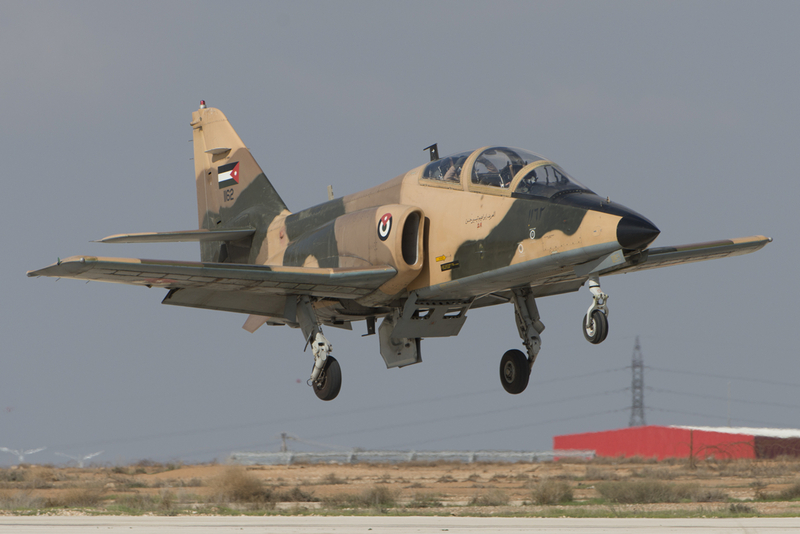 The four to-be delivered aircraft are still in the U.S. but they are expected to arrive in Jordan by June 2016”. 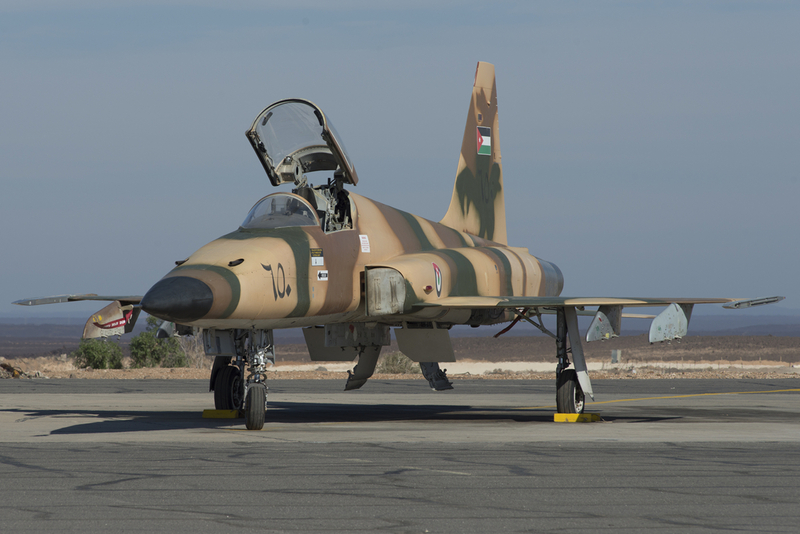 These last four aircraft were initially earmarked for delivery to Yemen as a gift from the UAE but because of the turbulent situation in Yemen, they will be delivered to Jordan instead. 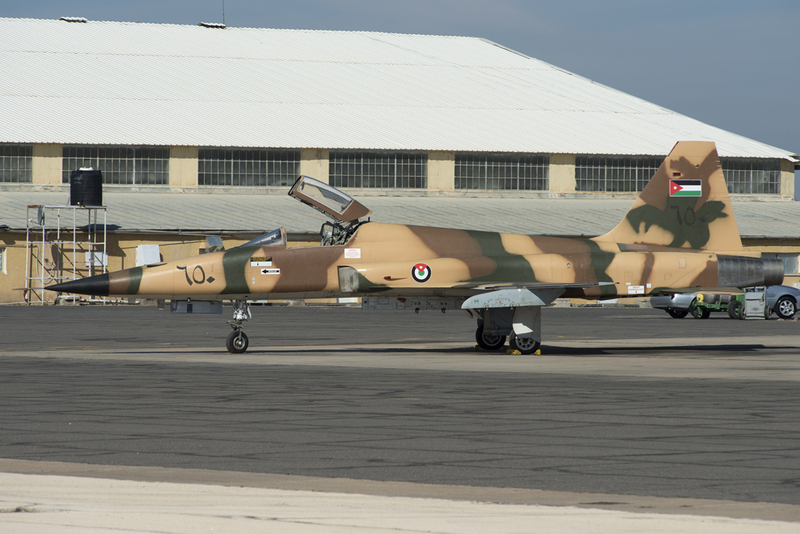 Two were recently noted at Waco (TX) with white Spraylat over the fuselage carrying Yemen Air Force roundels. 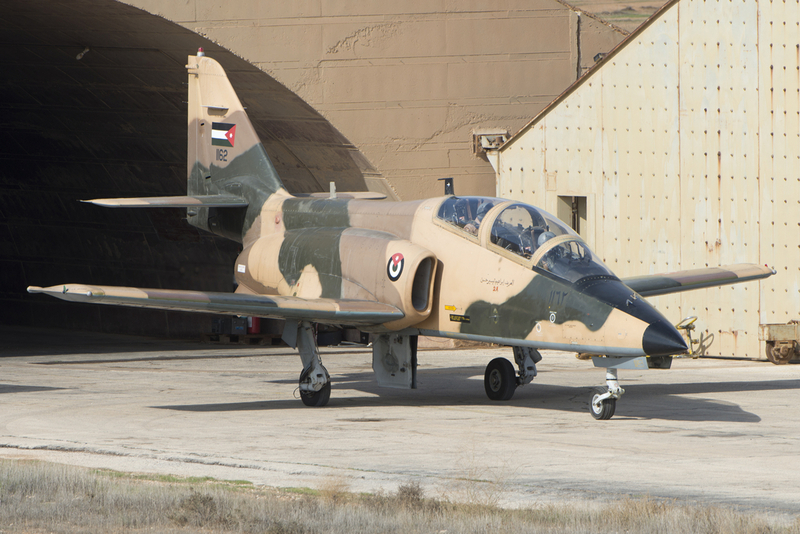 After one year of service in Jordan, the last four aircraft will also go through the Block 3 modification. 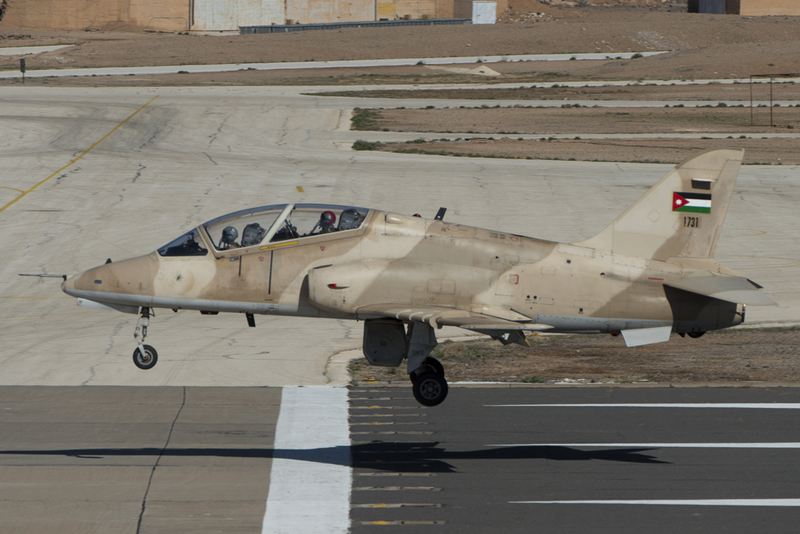 The six AT-802 that are currently in the inventory have both the ISR and strike capability. 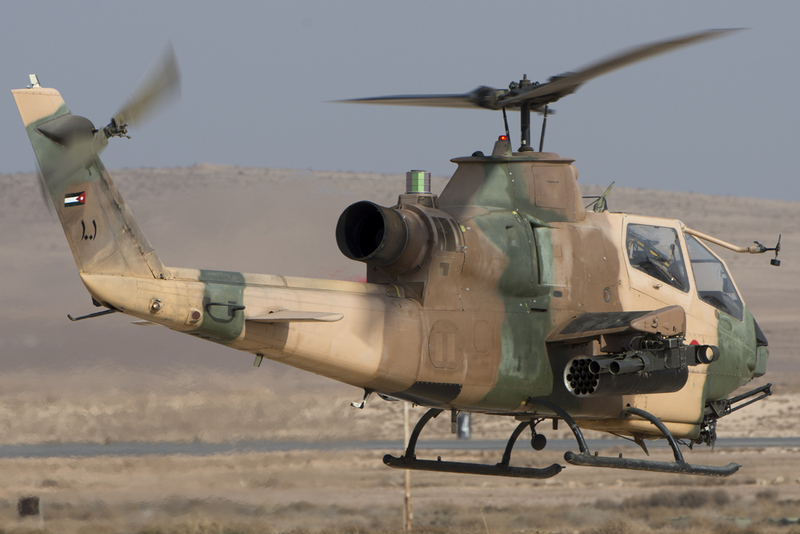 The L3 Wescam MX15Di sensor turret system is being installed and once upgraded, they can carry and fire Hellfire, GBU-58 Paveway and GBU-12 Paveway II laser-guided bombs. 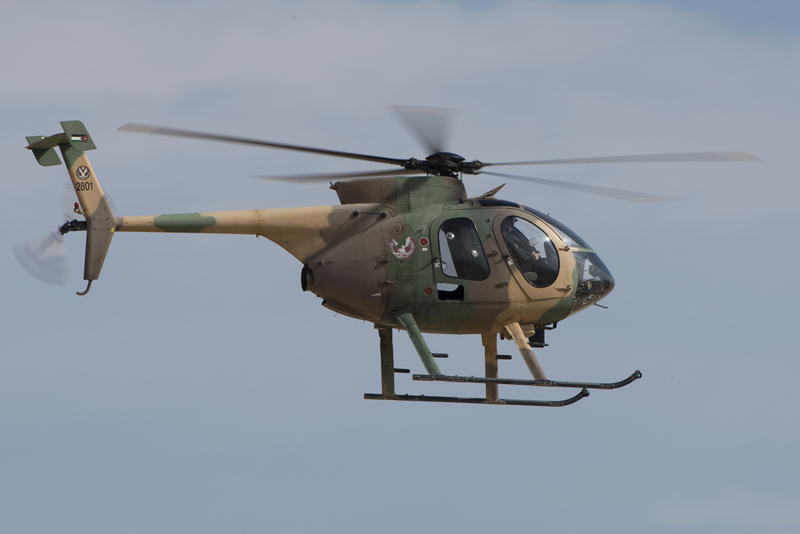 In the current inventory, the RJAF has ten Schiebel Camcopter S-100 on strength (twelve delivered, two were lost) and four Finmeccanica Falco UAV while the new Falco, the Falco EVO is being evaluated for future use. There is a bilateral project running with the Italian Air Force in which the Falco EVO UAV is being developed as an armed UAV and if the evaluation proves to be successful, the RJAF is interested to acquire a number of them. 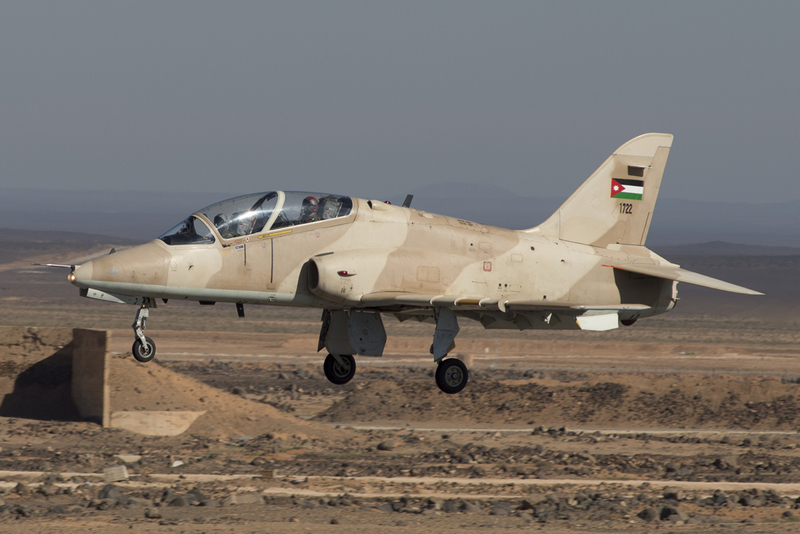 Battle Damage Assessments of strikes by RJAF forces are now provided by Intelligence, Surveillance and Reconnaissance (ISR) platforms of the coalition forces. 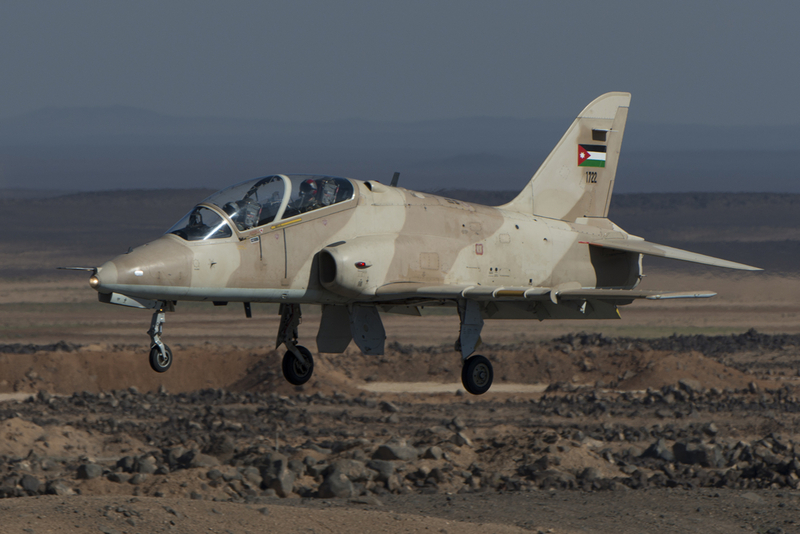 “Jordan is seeking the ISR capability of its own but than in a dual role, both a sensor and a shooter. Any UAV that has both capabilities, we are interested in. 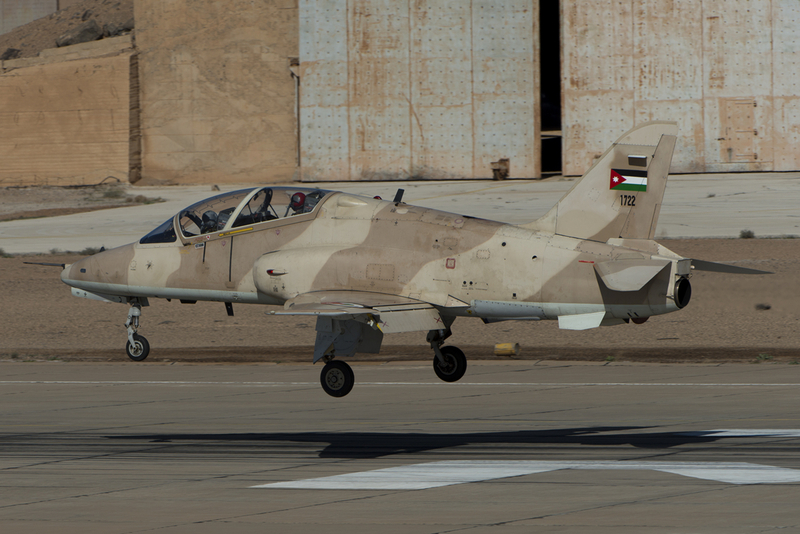 In fact, we did ask for the predator but I do not think the US are willing to export this technology to Jordan. They have shown willingness to export the Predator XP as a sensor but we want a dual-role platform”. Recently, the RJAF purchased some CASC Rainbow (Cai Hong, abbreviated as CH) CH4B armed UAVs which are expected to enter service in January 2016. They have a satellite link so they can be operated from thousands of miles away. 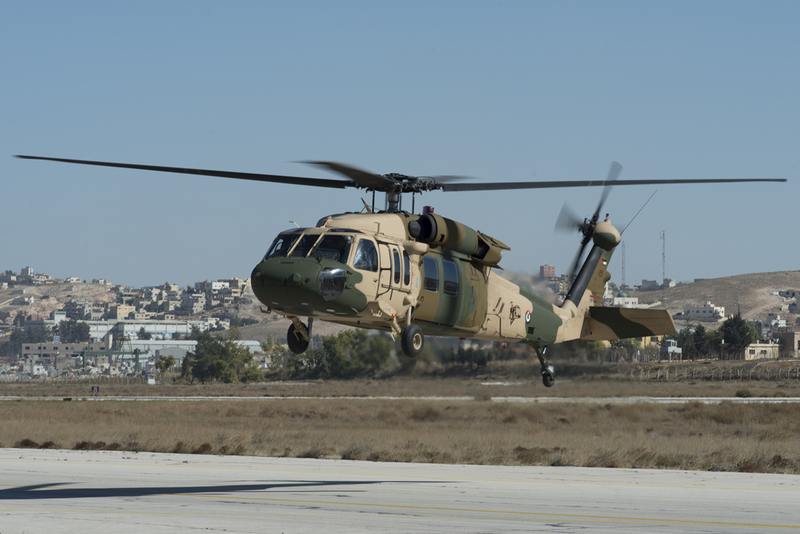 In August, Israeli news outlets reported that Israel will provide Jordan with twelve advanced Heron TP and Skylark Unmanned Aerial Vehicles. If the Israeli drone order will really materialize needs to be seen, however. The current main role of the rotary wing based at Amman-Marka is tactical and VIP personal transportation. This will be changed in the future and the goal is to create a Quick Reaction Force. 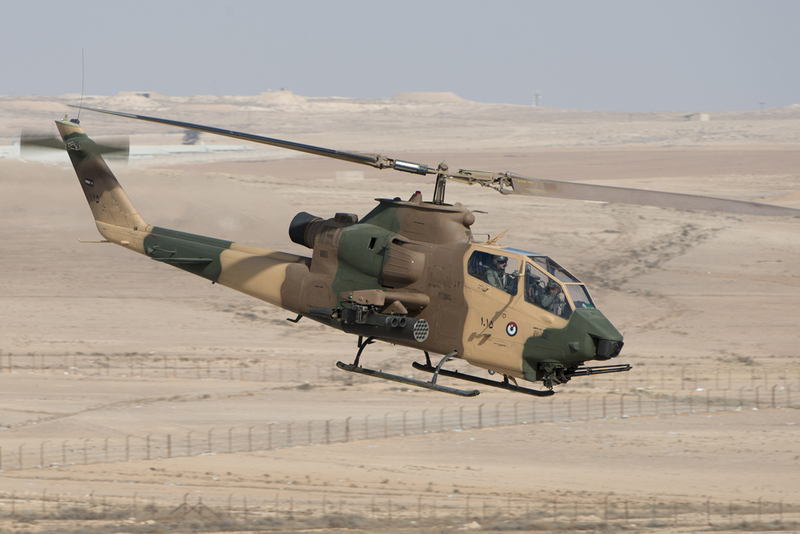 To enable this capability, up to 24 Black Hawk helicopters will be purchased. The initial sixteen were ordered and the first deliveries have taken place recently. “The Black Hawks are already in the inventory and we have good experience with them. They will also be used for border patrol and our Special Operations Forces are involved in setting up the QRF.” The newly delivered Black Hawk helicopters will most likely get the sensor systems that are also fitted on the current UH-60L fleet operating in Special Operations Command (SOCOM) and are operated by the Airlift Wing at Amman-Marka. 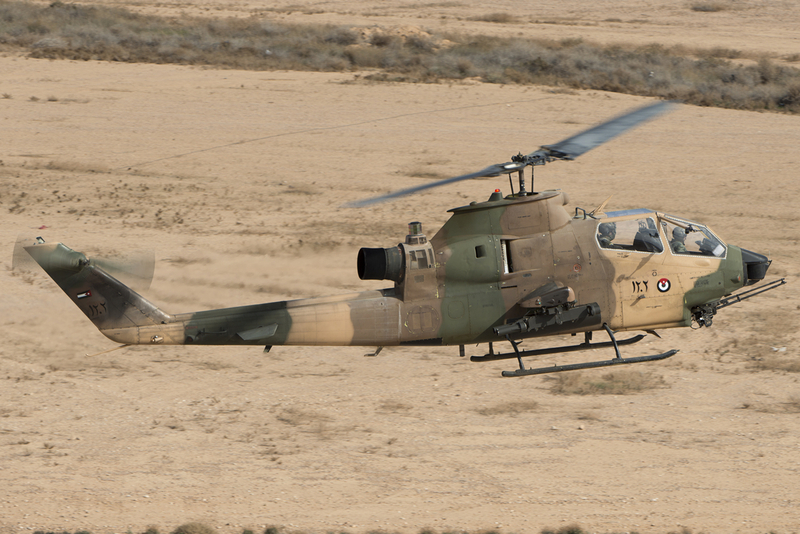 They will be replacing the few remaining UH-1H and EC635’s of 8sq and 14sq respectively, which will be disbanded. 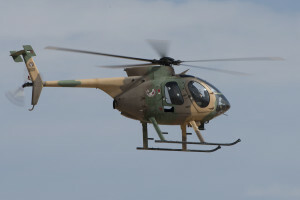 The performance of the EC635 is not deemed well enough by the RJAF and they will be sold off, if a buyer will be found. 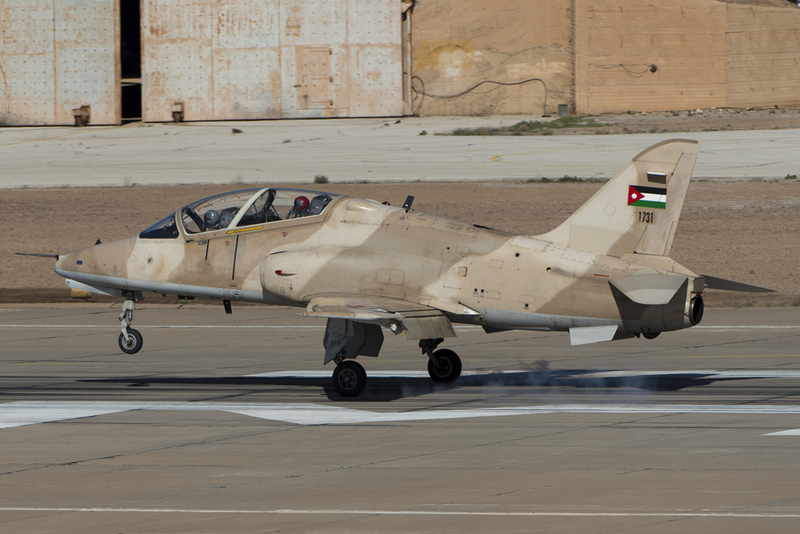 Jordan received a considerable number of Cobra’s over the years. 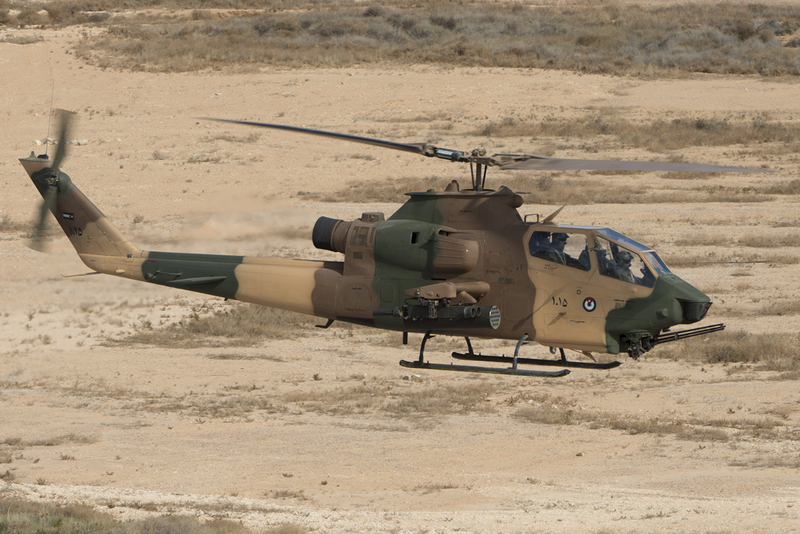 The first 24 Cobras were AH-1S Stage 3 (modernized) aircraft, built for the US Army with Fiscal Year 1982 serials. 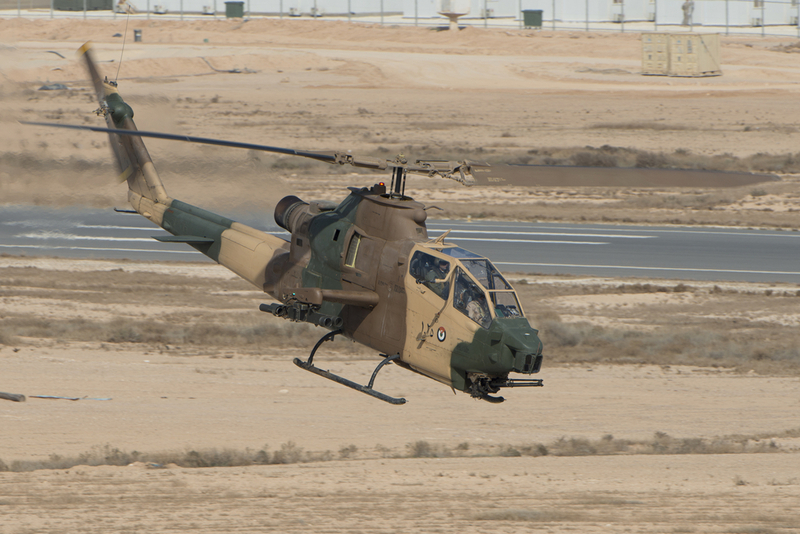 This standard of AH-1 was later re-designated AH-1F and the first examples were transferred to Jordan from 1985 onwards. 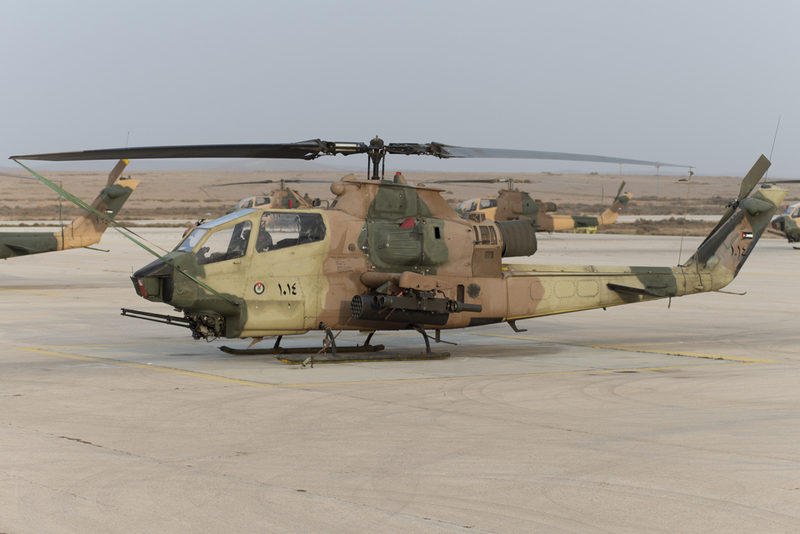 These were augmented by eighteen (two batches of nine) aircraft under Military Assistance Program deliveries from 2001 and approximately sixteen ex-Israeli Air Force AH-1E/F Cobras that were refurbished and handed over to Jordan in 2014 in a U.S. approved deal. 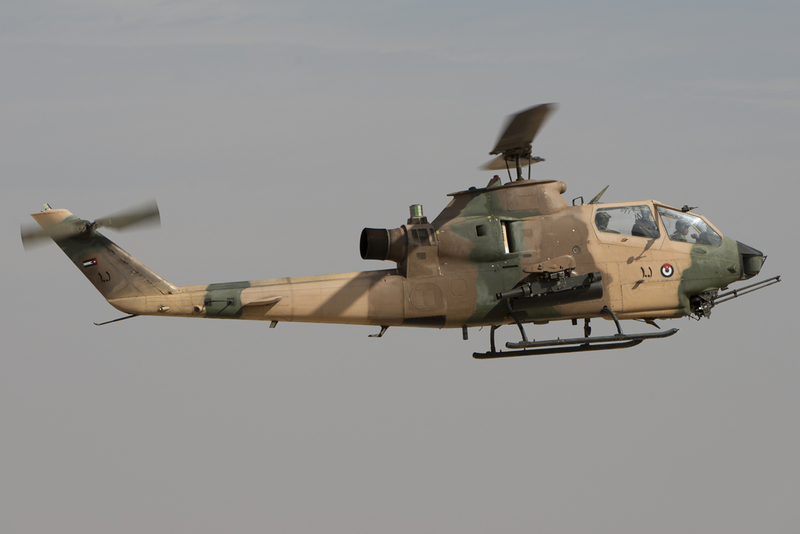 At least eight AH-1F helicopters were transferred to Pakistan in 2013. 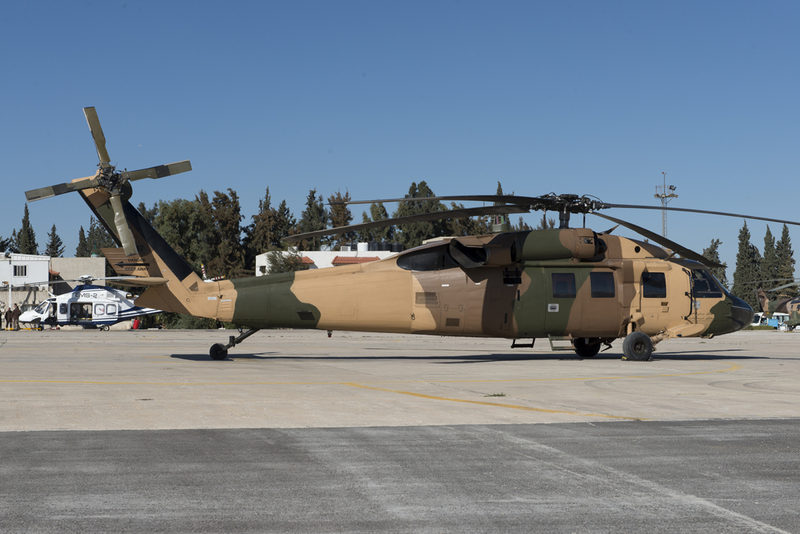 “We now have 36 aircraft on strength, we have a contract with a subcontractor in the U.S. Science and Engineering Services (SES) from Huntsville, Alabama, to upgrade them. 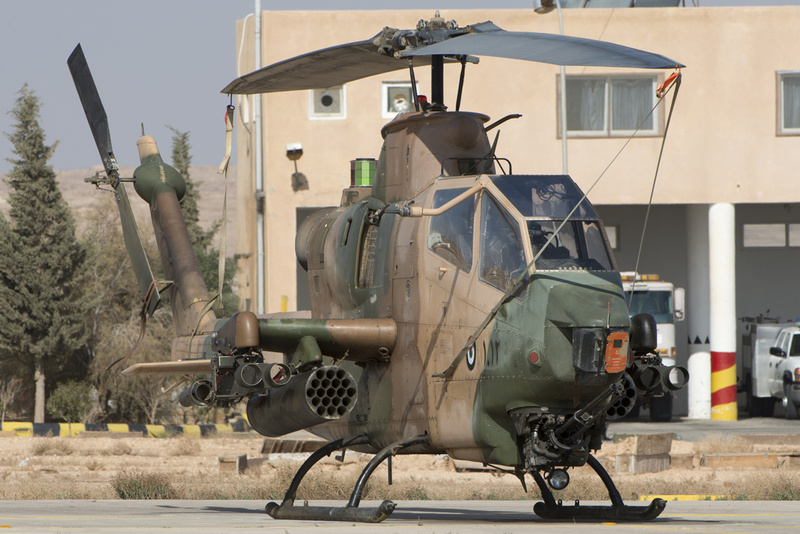 The helicopters are fitted with a glass cockpit and the avionics will receive an upgrade to enable them to fire Hellfire missiles and other guided missiles. We are expecting the first two by June/July 2016. 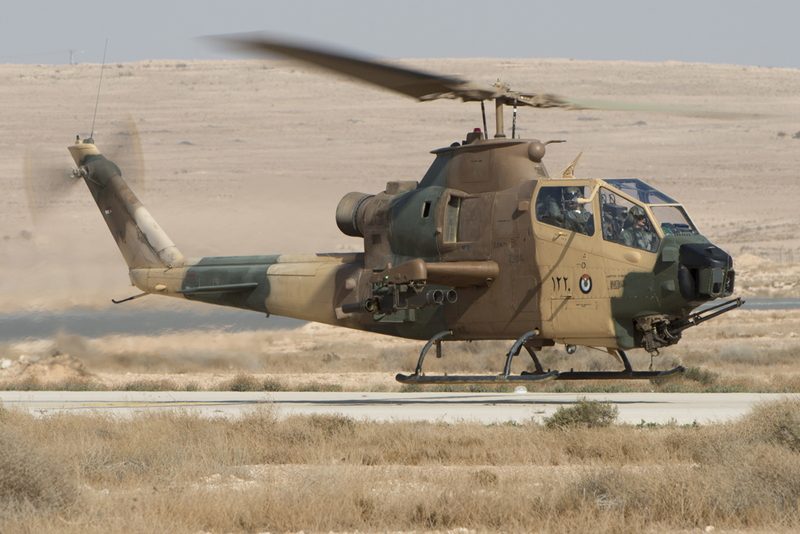 Currently six aircraft are in the U.S. undergoing upgrades.” The current version of the Cobra helicopters can already fire the BGM-71A TOW air-to-surface missiles as well as unguided 70mm rockets. In the nose, a M197 20 mm Gatling gun is fitted. Constituting one of the most potent border protection capabilities in the entire Middle East is the combination of the six Cessna C208B-ISR Grand Caravan C3ISR (Command, Control, Communications, Intelligence, Surveillance, and Reconnaissance) platform with other types. Together with the AT-802, the Cobra helicopters, two Airbus AC235 gunships and two S-100 Camcopters, the Caravans perform round-the-clock surveillance of the borders. 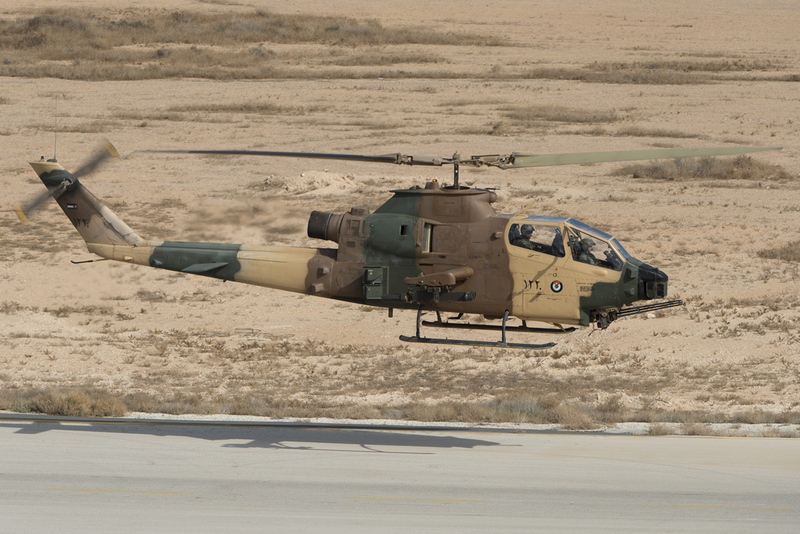 There is a permanent detachment of one Ce208B-ISR and six of AH-1F Cobra helicopters to the airbase closest to Iraq, Rweished AB (H4), conducting border protection duties. “Regarding Command and Control, we used to be C2 but now we are C3I (Command, Control, Communications & Intelligence) so the situational awareness is very high now.” Says General Aljobour. 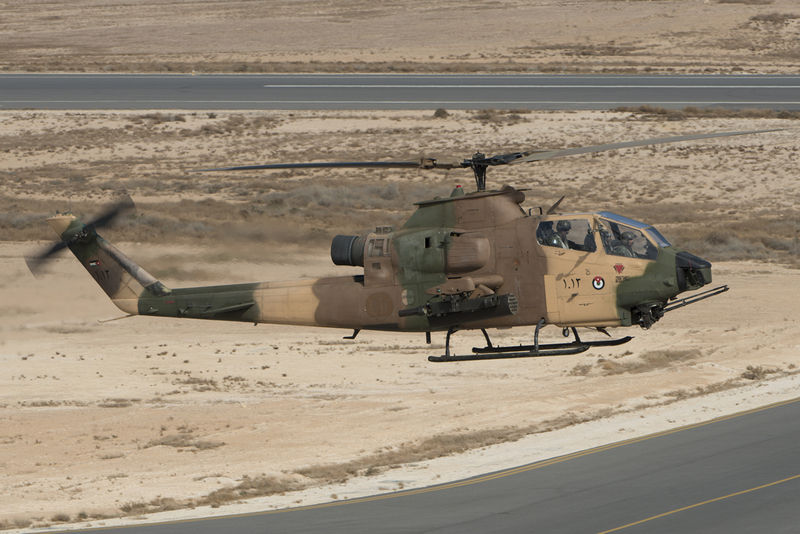 The C3ISR system is integrated with the Hawk air defence systems and the AC235 gunship and the F-16s also have Link 16 capabilities that supply the RJAF with a fully integrated defence system. Two CASA 295’s were acquired and there is a competition between Airbus and another company to perform the upgrade to the AC295 gunship variant. 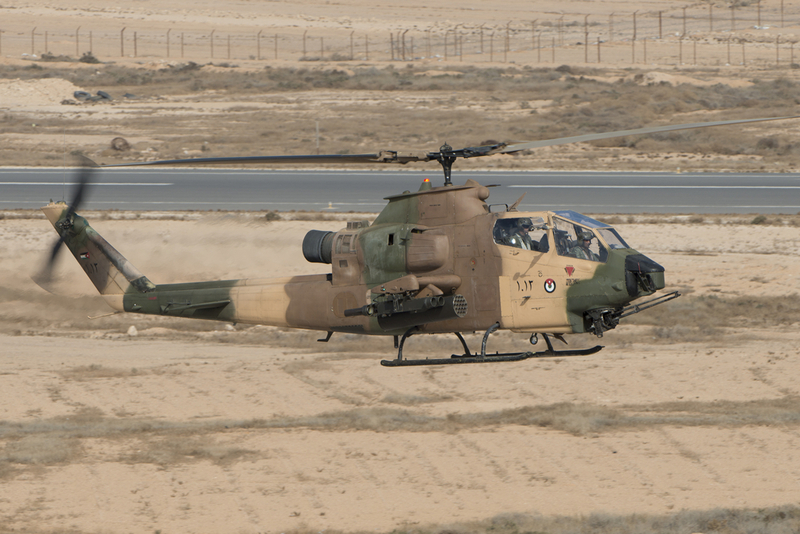 At least one AC235 gunship is forward deployed in Saudi Arabia now, performing operations over Yemen and it has proven very successful so far. “It has been a very successful project and we encourage other countries to either join us of follow us”. 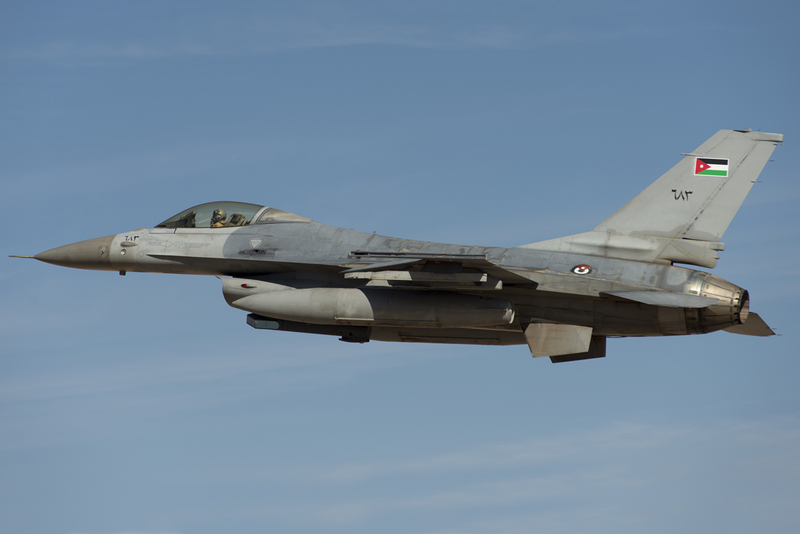 In support of the operations over Yemen, the RJAF also deployed four F-16s while the AC235 provides Close-Air Support (CAS). 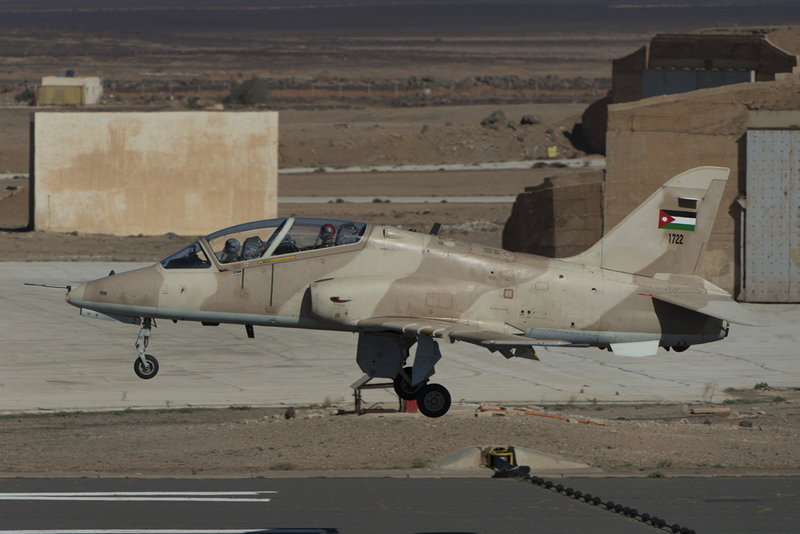 “Despite the support to the forces fighting in Yemen, this is a secondary target for the RJAF. 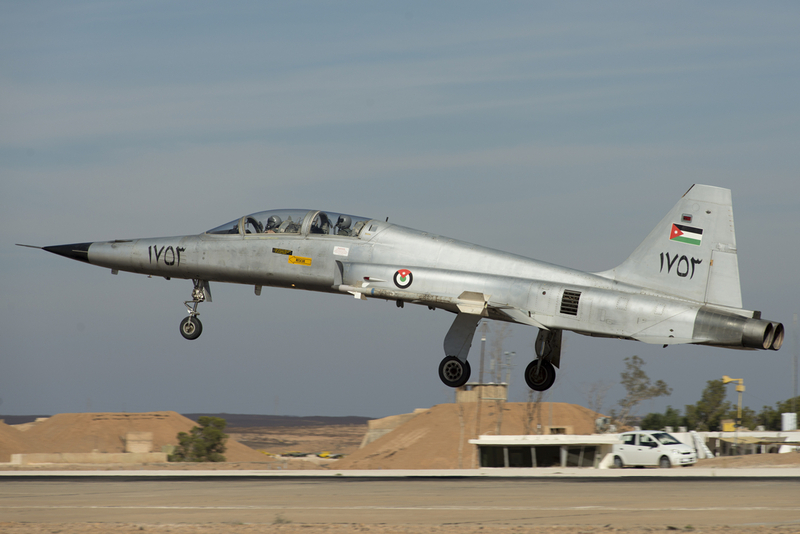 The primary target remains Syria, where the RJAF is fighting ISIS.” Says Aljobour. 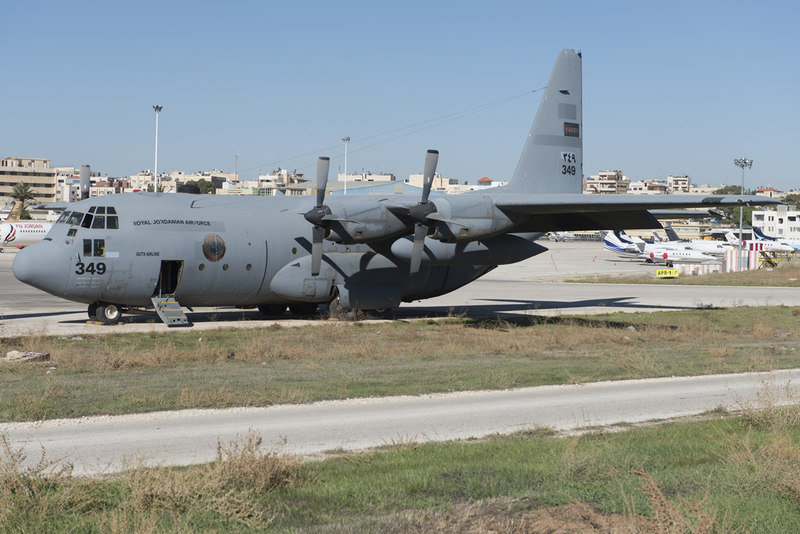 In March 2016, the RJAF wants to enter a bidding for the transfer of a number of ex-Royal Air Force C-130J’s. However, the recently released National Security Strategy and Strategic Defence and Security Review 2015 proposed to keep the current fleet of Hercules C4 and Hercules C5 in service. 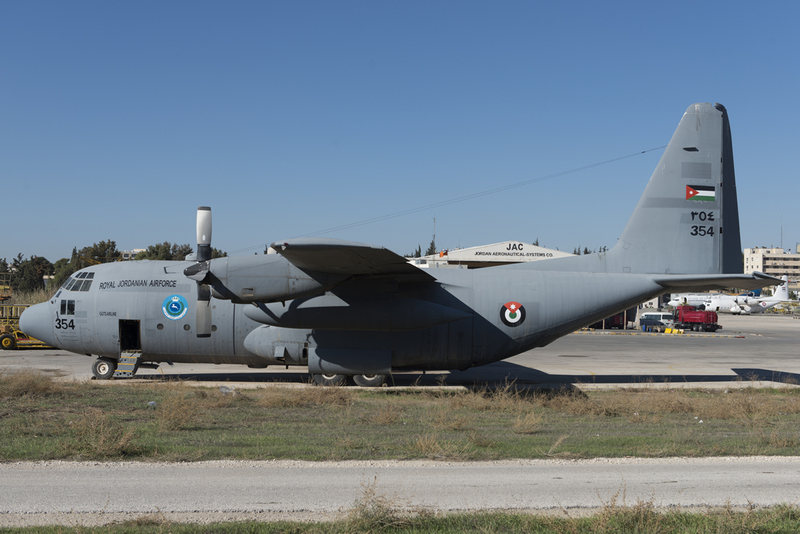 Alternatively, the RJAF will upgrade the current fleet of C-130H and C-130E or if that is not viable, they will buy new C-130J transporters. In the strategic transport role, the RJAF operates two Ilyushin Il-76MF which can carry up to 60 tons each. 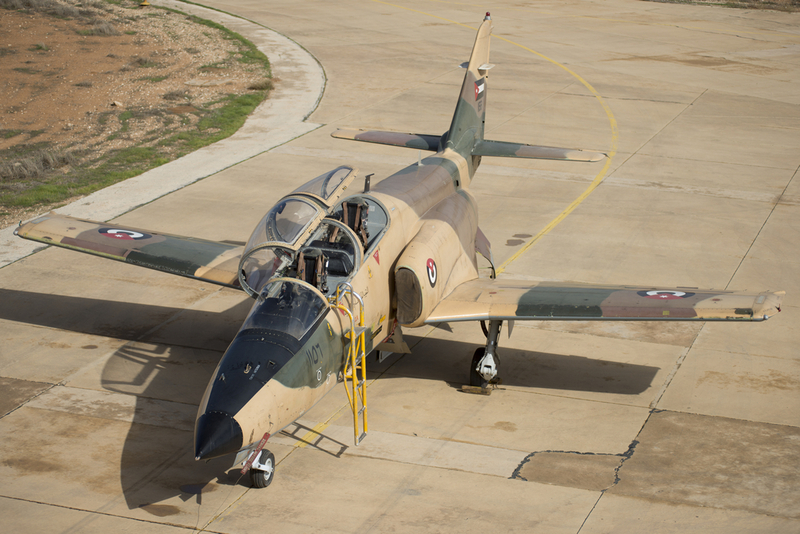 On December 1st, the status of the King Hussein Air College (KHAC) located at Mafraq, was changed to “Air University”. The KHAC was recently accredited as such and this will allow it to give a degree in aviation-majors to the students like Air Traffic Control, Navigation and Meteorology. Three training squadrons and the Instructor Pilot School are located here. When asked how the next ten years look like for the RJAF, the General states “It all starts with the Human Resources, our troops should be ready for whatever is coming in the future. The first thing that I changed, is the training. 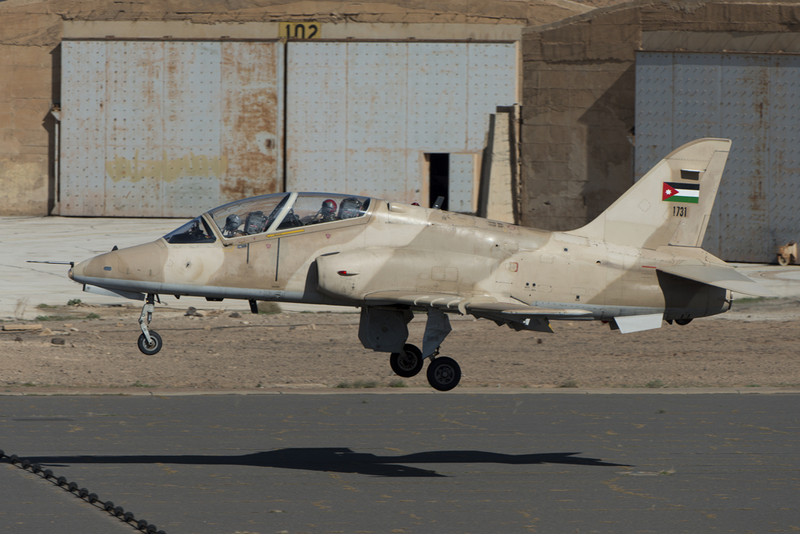 We will get nine Pilatus PC-9M, the contract is signed and the Swiss-made aircraft will replace the CASA 101.” Since 1987, 11sq is operating the CASA 101CC in the advanced training role. 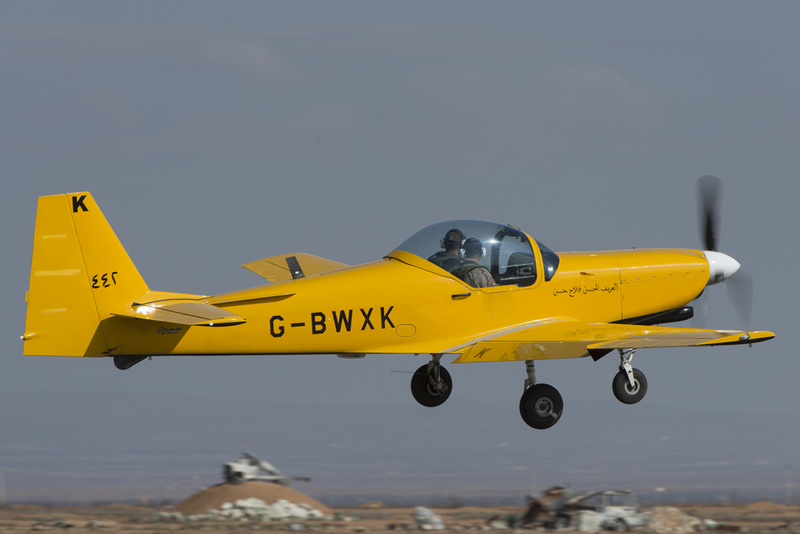 The basic trainer role is currently fulfilled by the Slingsby T-67M-260 Firefly, of which sixteen were delivered from 2002 onwards. 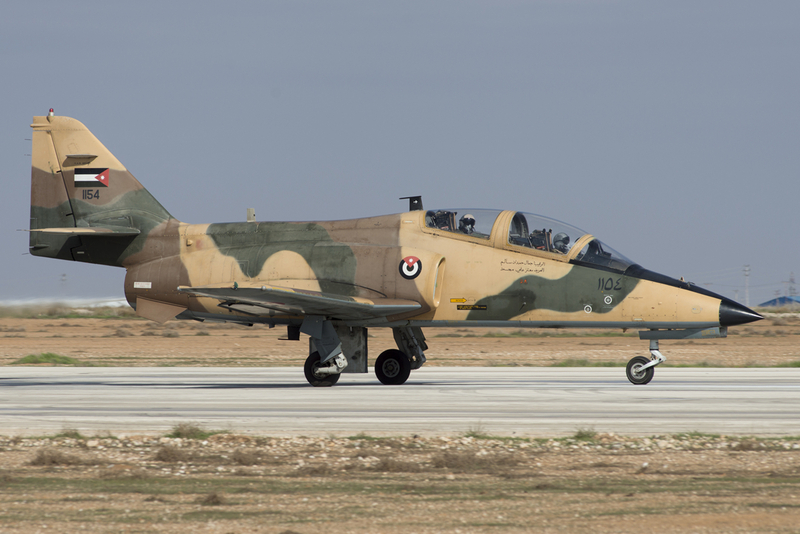 These were augmented this year by eight former RAF/Defence Elementary Flying Training School (DEFTS) T-67M-260. 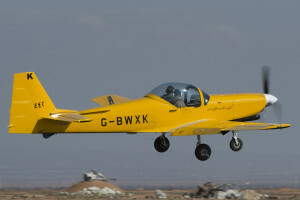 The Fireflies are still sporting the former British civilian G-registration and are solely operated by the Instructor Pilots School and appear to be a stop-gap solution until a new basic trainer is introduced. 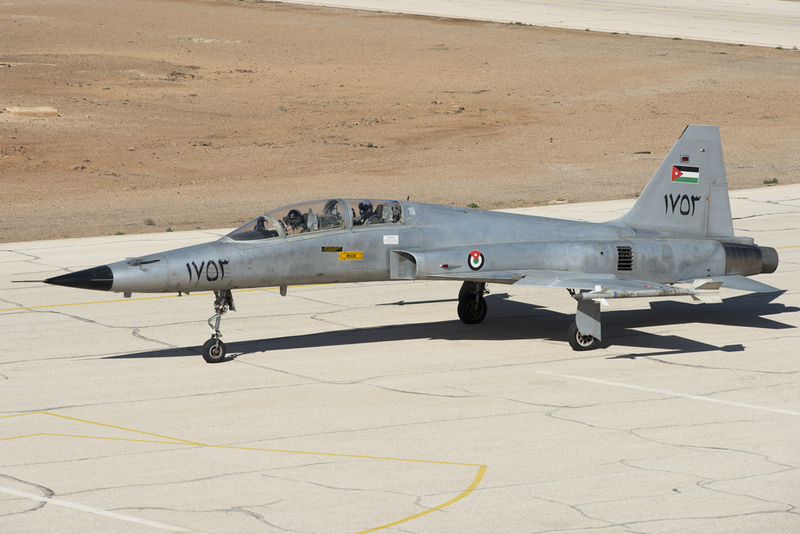 “We are in the process of buying a newer plane for the Basic Training Role.” says General Aljobour. The Grob 109TP was one of the planes that was evaluated but it is too early for a decision yet, more contenders will get the chance to demonstrate the capabilities of their aircraft. “We phased out the Hughes helicopters because both the H500D and H500E were old and we replaced them with the Robinson R44 Raven II”. 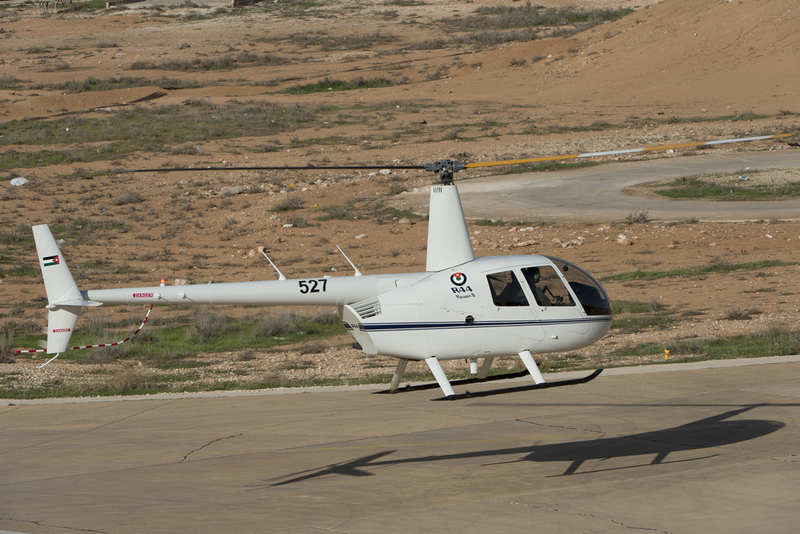 5sq operates eight R44 II light helicopters in the basic training role. 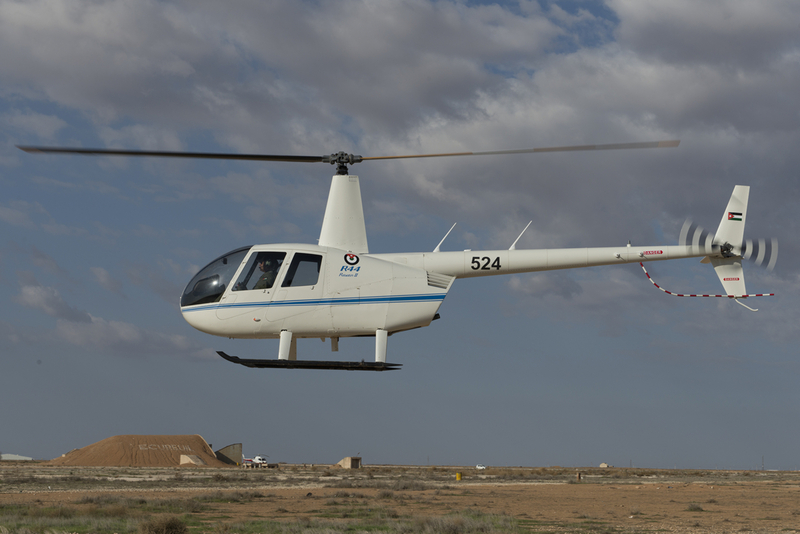 The R44 gained its full operational capability in April 2015 and they replaced the H500 in late 2014. 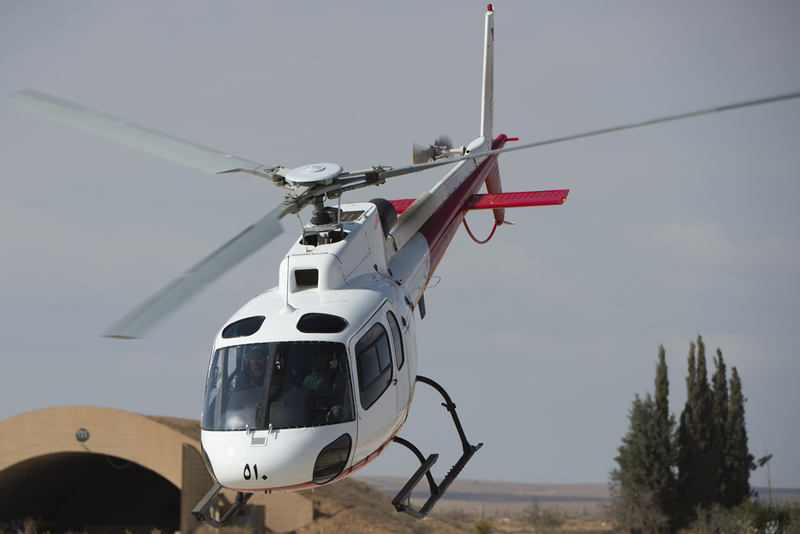 Until then, both the AS350B3 Squirrels and the H500 were operated by 5sq but since the R44 Operational Capability, the six AS350B3 are solely operated by the Instructor Pilot School. 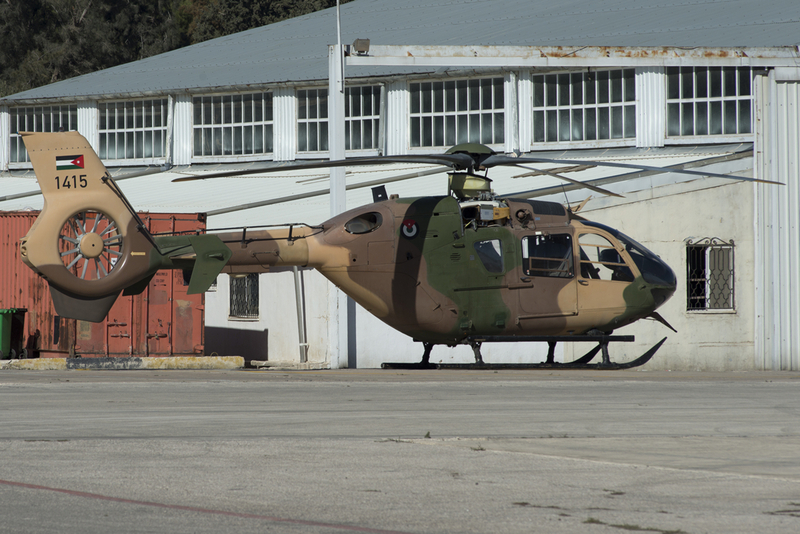 The H500’s are for sale and are awaiting a buyer in a hangar at Mafraq. 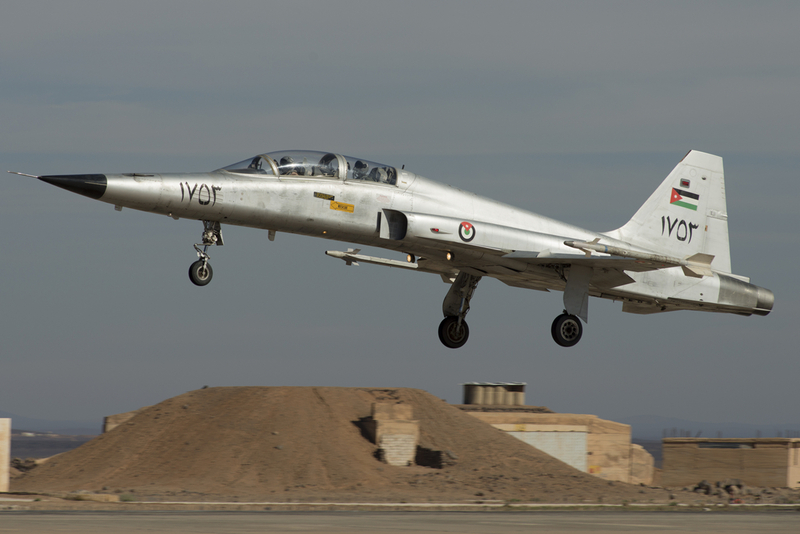 In the Lead-in Fighter Trainer (LIFT) role, the F-5 aircraft were phased out last year and a batch of the remaining aircraft will be sold off to Tactical Air Support “TacAir”, Inc. from Reno, Nevada. It is expected that they will be handed over before the end of 2015. 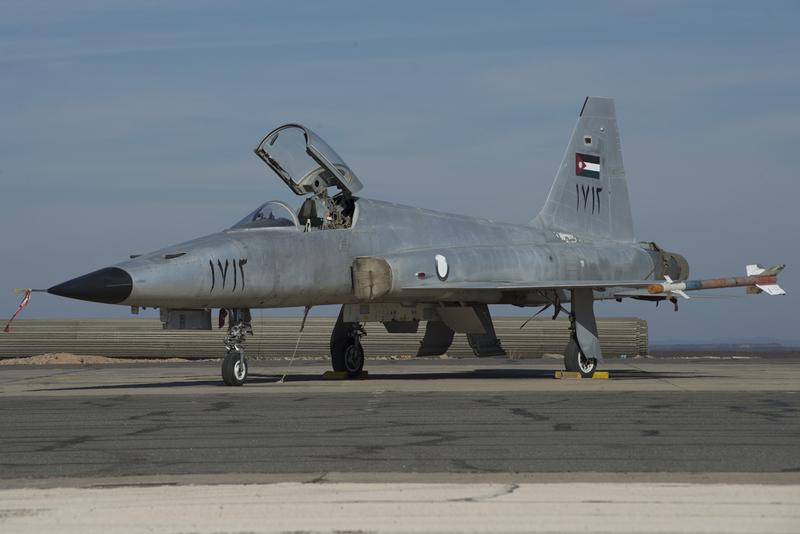 “We do keep two F-5s flying as part of the legacy. They are not involved in official missions anymore” states Aljobour. 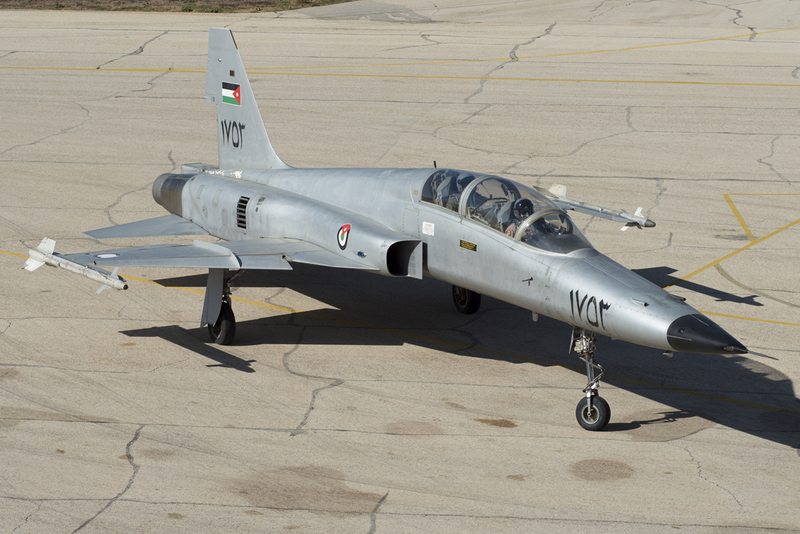 As a replacement for the venerable F-5 in the LIFT-role, the RJAF acquired thirteen former United Arab Emirates Air Force & Defence Command BAE Hawk Mk.63. 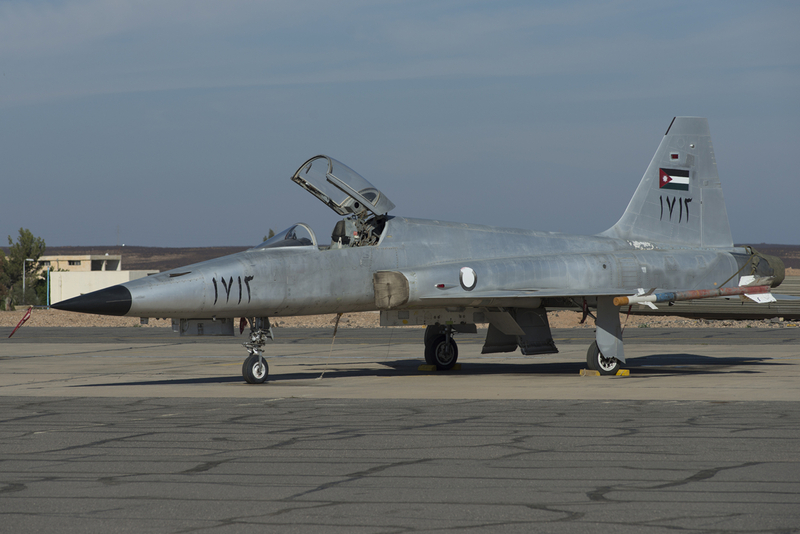 The RJAF would like to acquire additional BAE Hawks in the future, enabling more than one squadron to prepare pilots for F-16 operations. 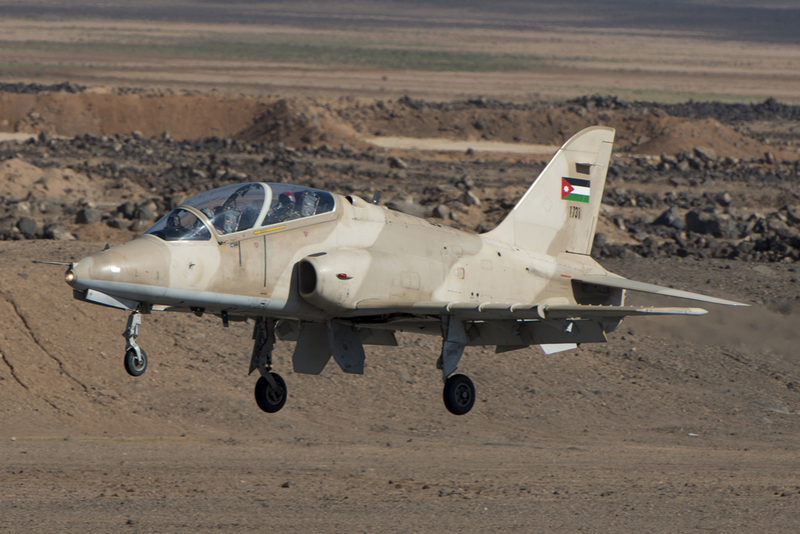 The plan is to upgrade the Hawk fleet with a more suitable avionics suite, making them more capable as a LIFT for aspirant F-16 pilots. “There are skills you only get from such an exercise, we were invited and we went” says Aljobour. 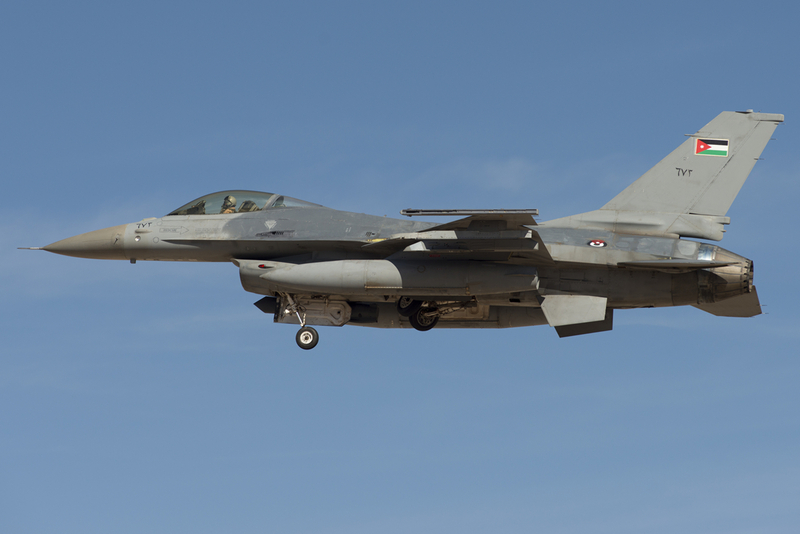 The RJAF participated in Red Flag 15-4 with four F-16AM’s and one F-16BM. 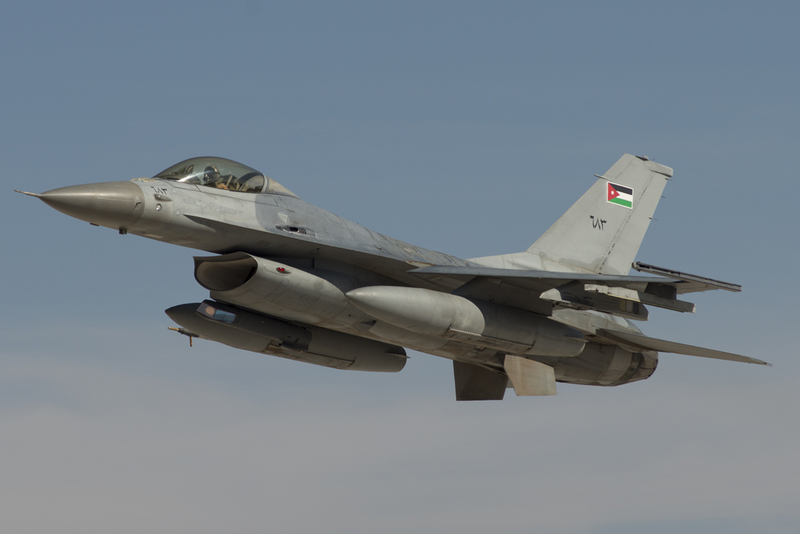 On the way to Nellis AFB, Nevada the Jordanian F-16s received aerial refuelling from the Israelis that were participating with a number of F-15s. 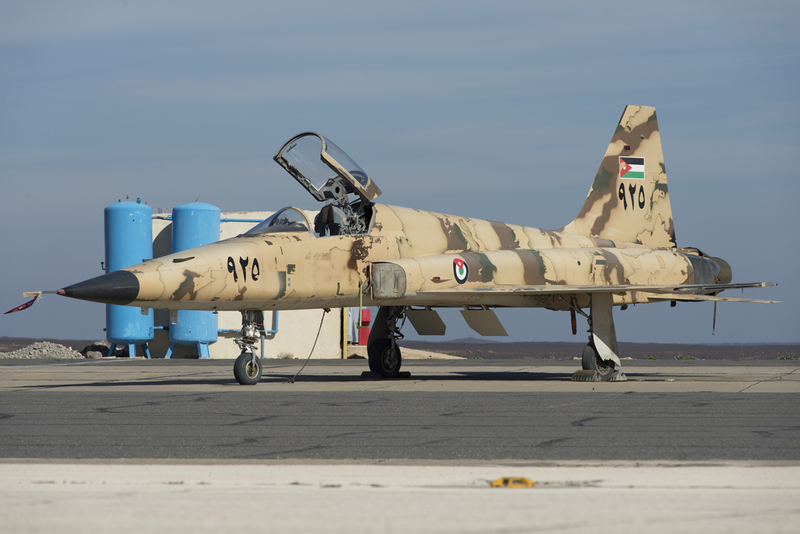 “When the pilots came back, they were extremely happy with the experience they got from the RF exercise. The skills they learned will stay with them for a long time”. 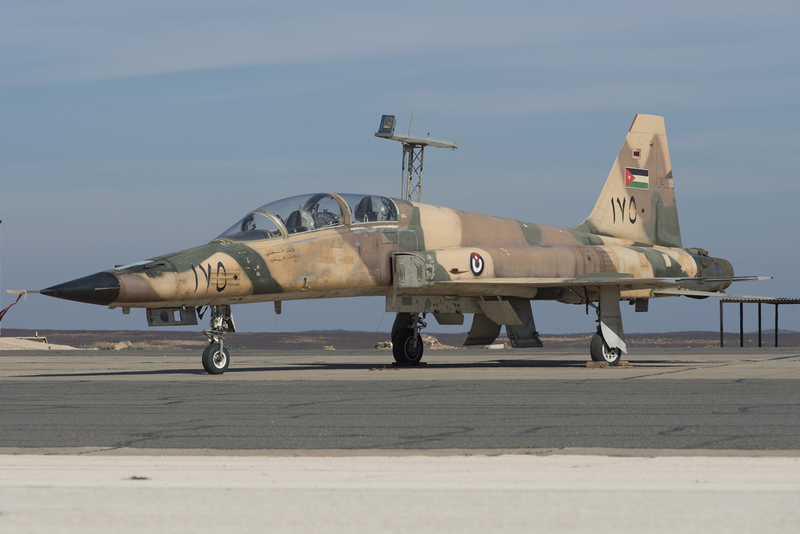 The participants of the Red Flag exercise, experienced that the scenarios that were played out were exactly fitting for the current threat Jordan faces. 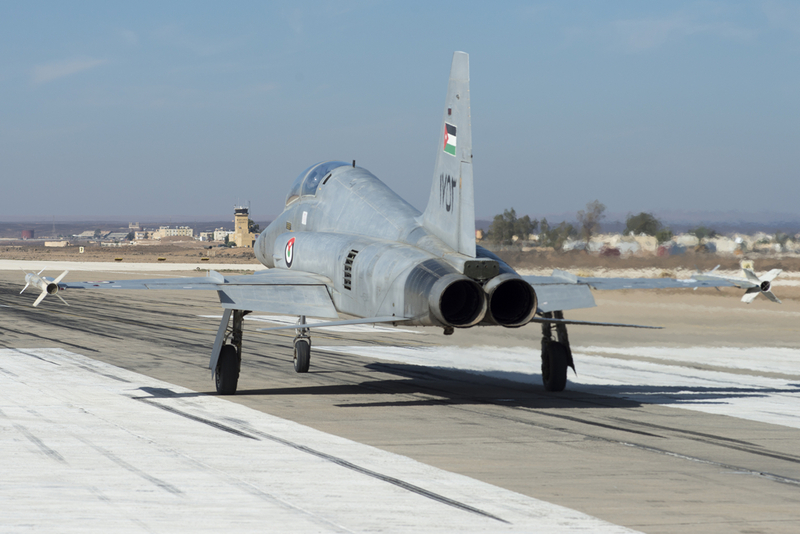 “Red Flag is high on the Agenda of our High Command and the RJAF would like to participate again in 2016 but if that is not possible, definitely in 2017”, says Aljobour enthusiastically. 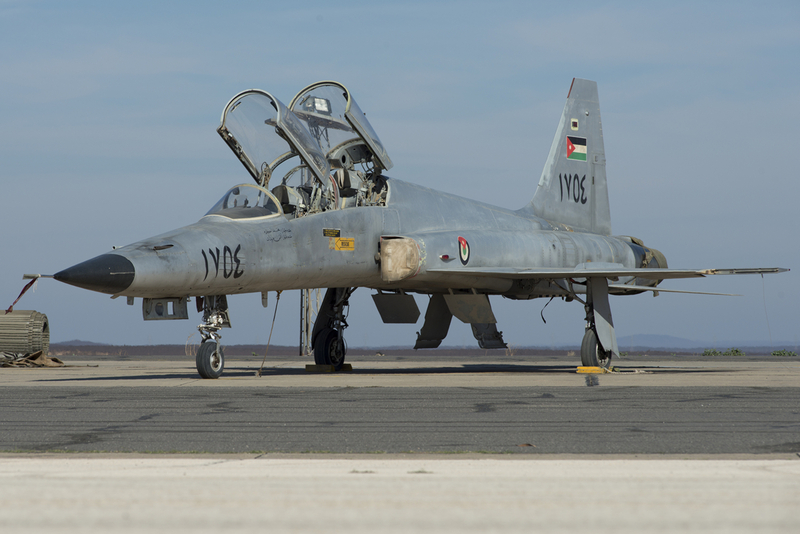 The RJAF pilots are constantly honing their skills and the RJAF has permanent exchange programs with a number of close allies, being the U.S., Pakistan, Turkey and the UK under which on a bilateral level, pilots are exchanged. 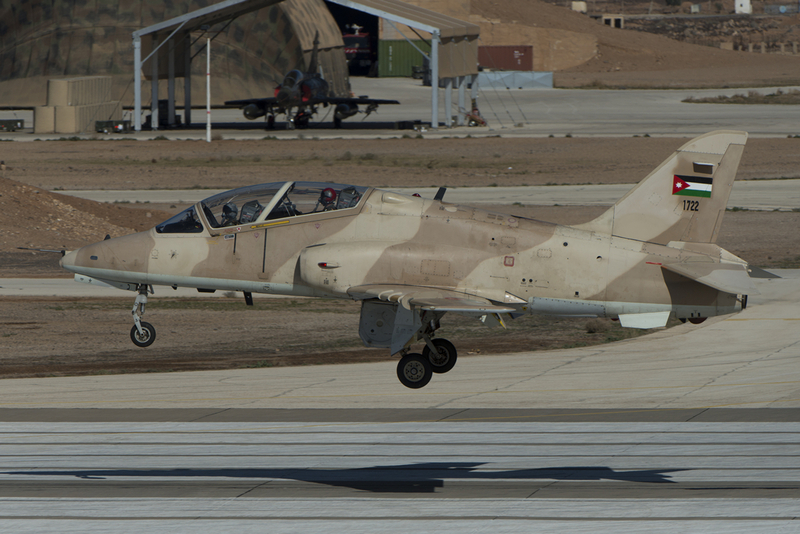 The RJAF proves to be a relatively small but very efficient air force that is showing agility and perseverance. 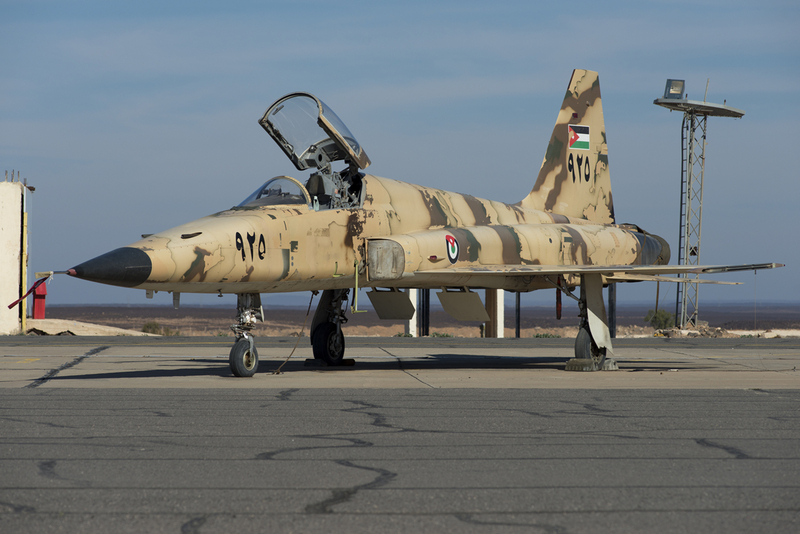 With an excellent training facility in the form of the Aviation University, recruits are trained to a high level, creating a good bases for a well-operating air force. 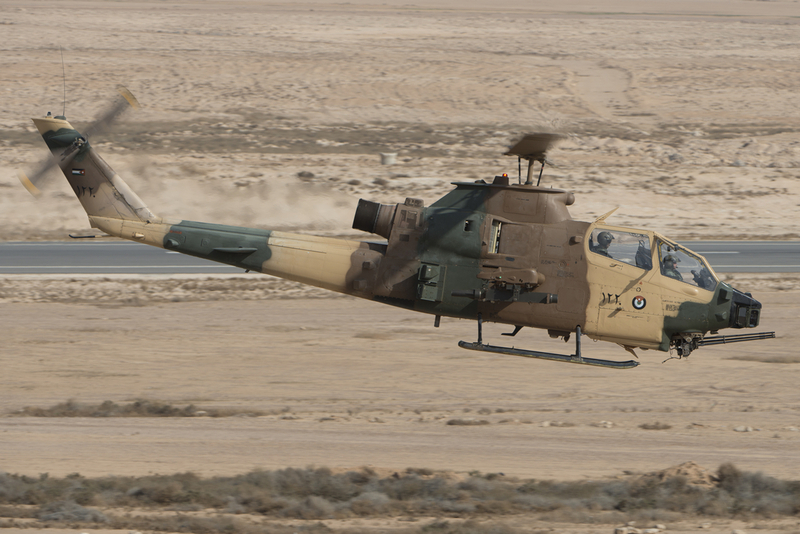 Despite the potential morale-killer of having a pilot publically executed by the enemy, the troops have done the opposite: they became even more motivated to fight the enemy. When looking at the agility, the RJAF has proven over the last couple of years to be able to introduce and adapt to new aircraft types. Aircraft that are not performing well enough are replaced with better ones. 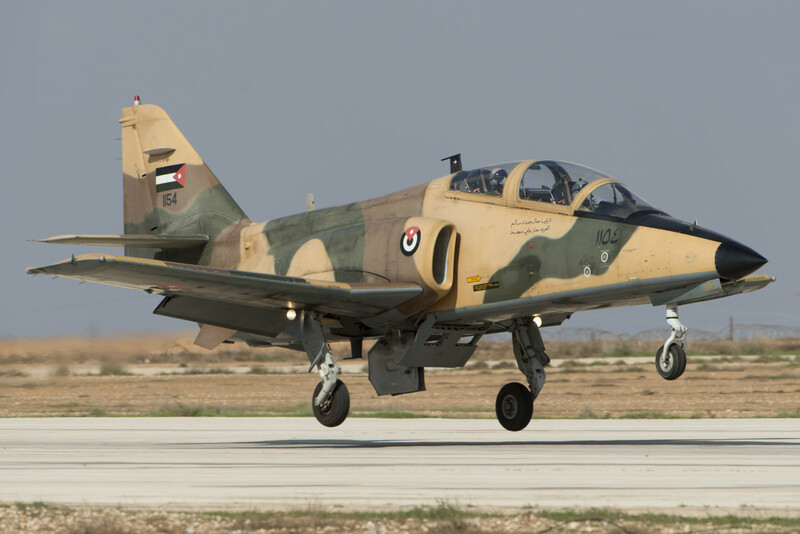 As long as the fight with ISIS is not over, Jordan will, due to its geographical location, be at the front lines. 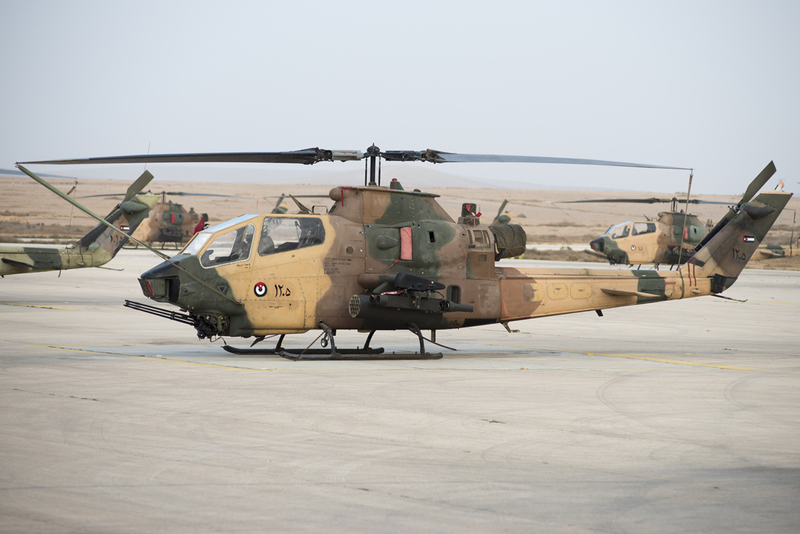 Supported by befriended Arab and non-Arab nations in the region, it will also remain a very potent coalition partner with unique capabilities to support the multi-national efforts to repel Da’esh. 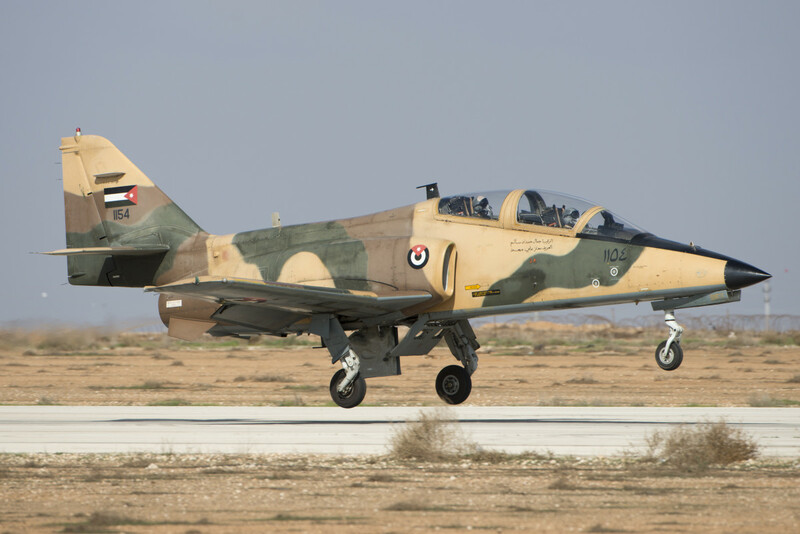 The authors would like to thank the RJAF Public Affairs Office, all the officers we have so openly spoken to and especially Major General Mansour S. Aljobour for the generous reception, openness and hospitality shown during our visit. Reserve base, nothing stationed now. 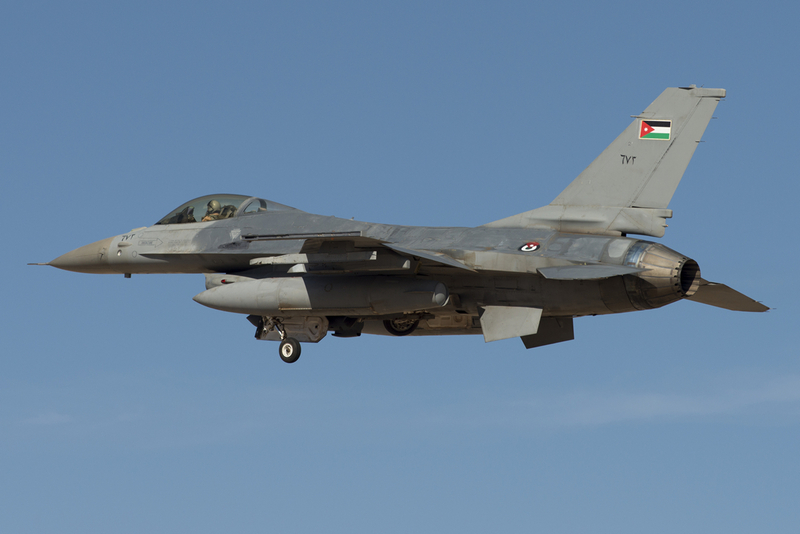 One squadron of F-16s has moved from here to Azraq for the missions against Da’esh. Approximately ten of the sixteen originally delivered CASA 101CC are still in service today. A number was lost and some are used for spares to keep the ageing fleet going. 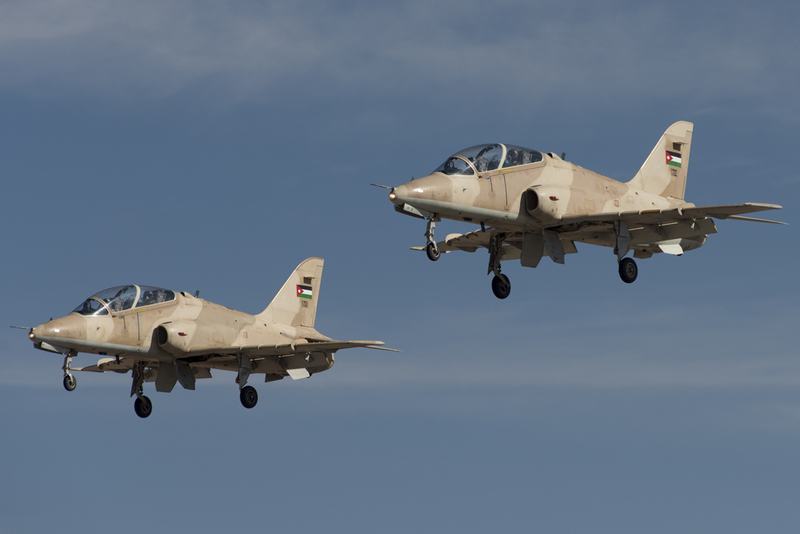 From 2017 onwards they will be replaced by the Pilatus PC-9M. 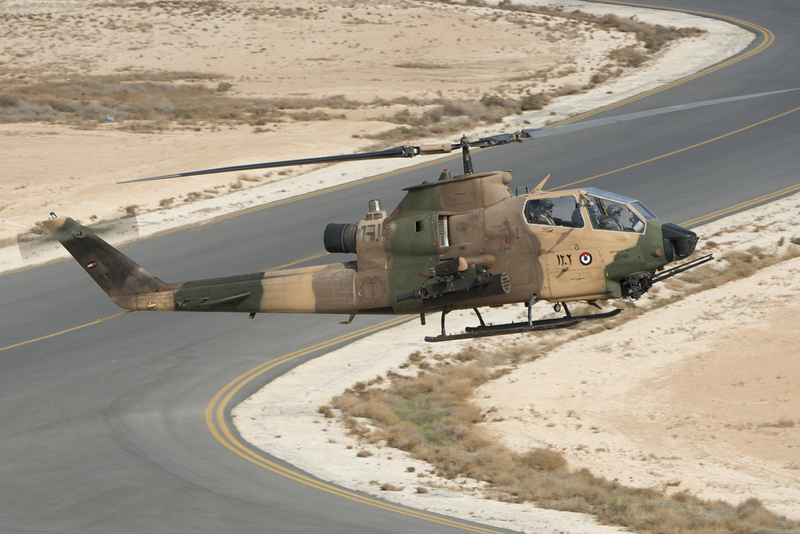 The Bell AH-1 Cobra helicopters operated by 10sq and 12sq play a vital role in the border protection. 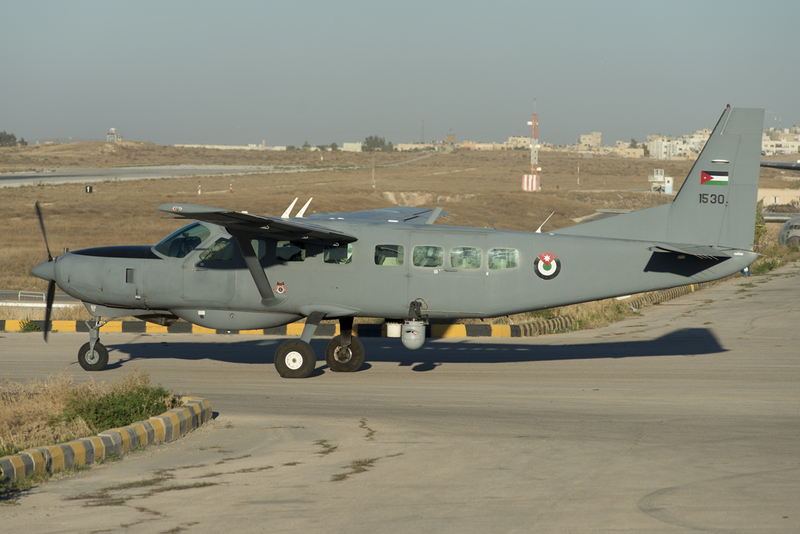 A permanent detachment at H4 is supported by the ISR capabilities of the Cessna 208B Grand Caravan that scan the borders or hostile intruders. 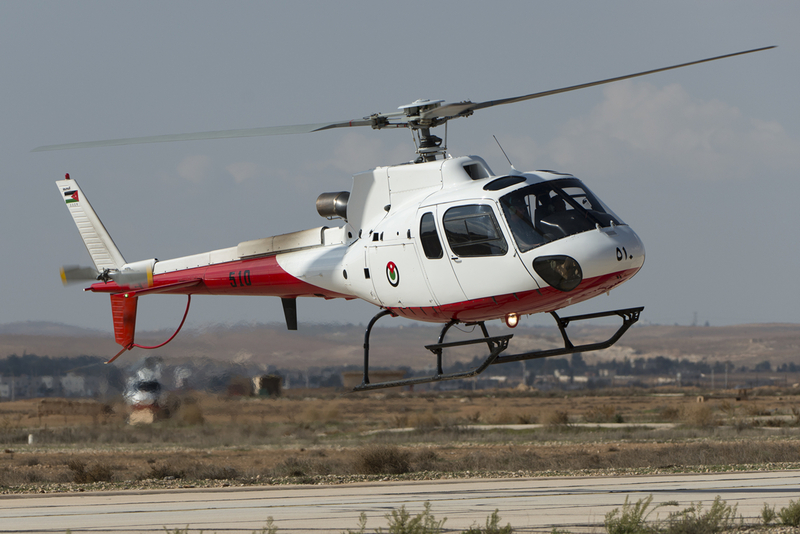 From 2003 onwards, nine Eurocopter EC635T1 military utility helicopters were delivered for border surveillance and the utility role. 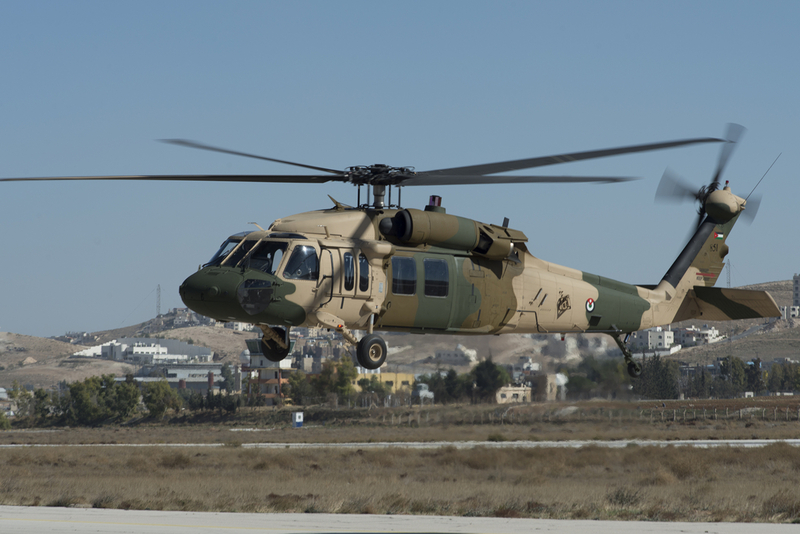 They helicopters are not performing well in the Jordanian climate and will be replaced by Sikorsky S-70/H-60 Black Hawk helicopters that will form a Quick Reaction Force. Command, Control, Communications, Intelligence, Surveillance, and Reconnaissance (C3ISR) capabilities are delivered by the Cessna 208B of 15 Squadron. 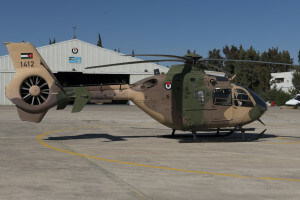 Now they operate out of Amman Marka but in due time they will move to King Abdullah II. 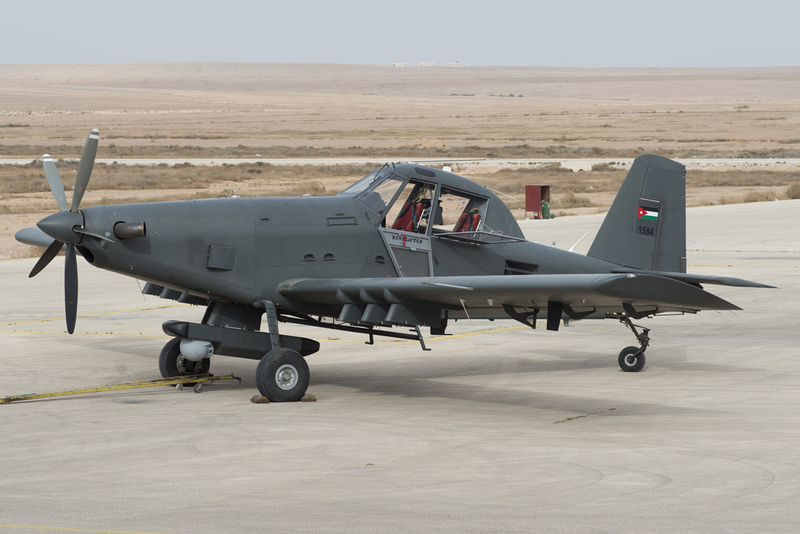 A small but mean machine is this IOMAX AT-802 Air Tractor of 15 Squadron. The current Block 1 configuration can fire GBU-58 Paveway and GBU-12 Paveway II laser-guided bombs. 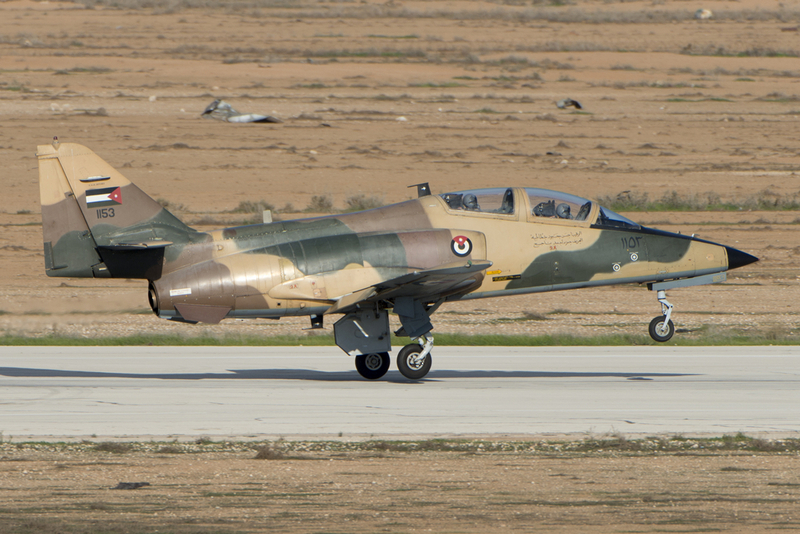 For many it was surprise to learn that the F-5E and F-5F Tiger IIs were replaced by the BAE Hawk. 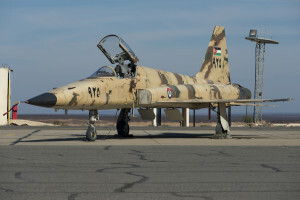 Jordan received thirteen Hawks from the United Arab Emirates and the F-5E and F-5F are now grounded and a number will be sold off. 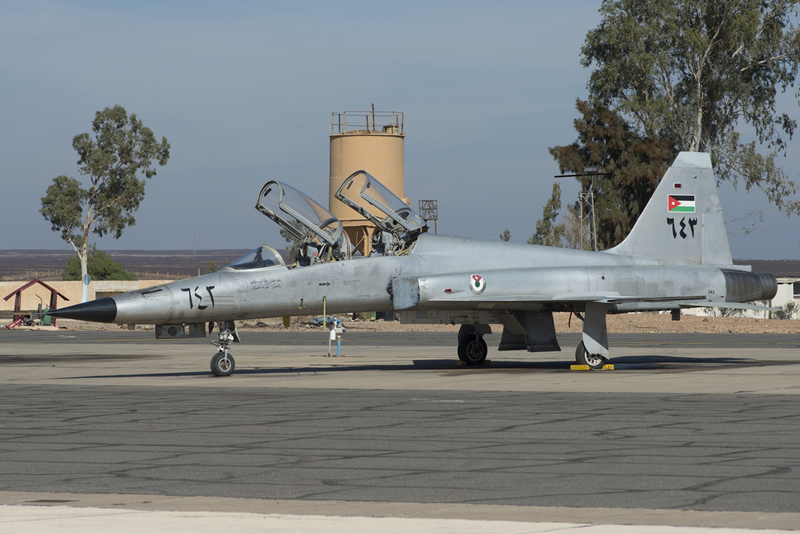 The RJAF will keep two F-5’s in flying condition “just to keep the legacy alive”. 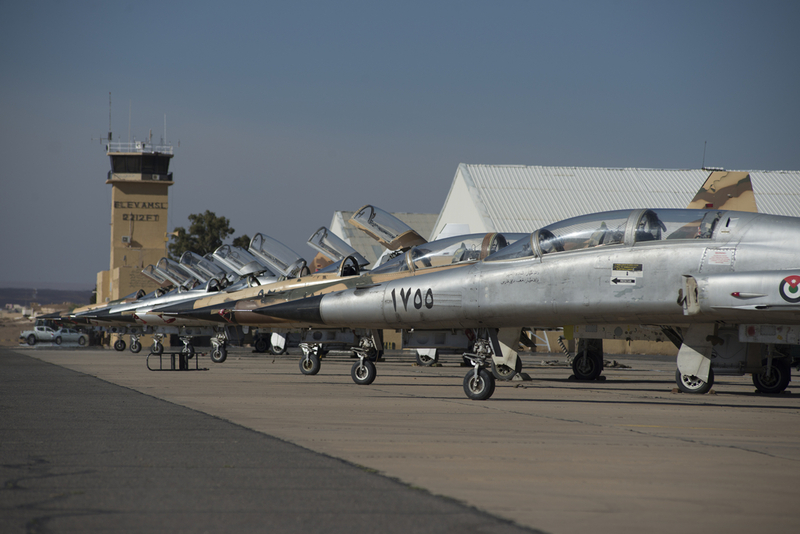 Most of the F-5E and F-5F aircraft that are now kept in pristine condition at H5 Air Base, will be sold off to TacAir in Reno, Nevada where they will be used to train pilots again. 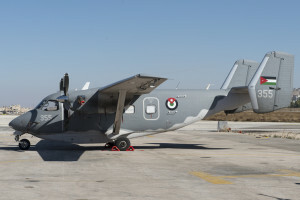 Only one PZL M28 Skytruck was delivered to the RJAF. Its role is not clear but it is to be expected that it is used for infiltration and exfiltration of Special Forces troops. 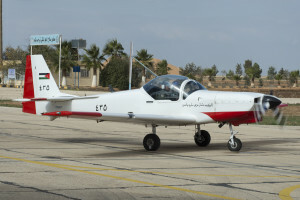 The King Hussein Air College at Mafraq operates two types of Slingsby Firefly trainers. The white ones are operated by 4sq as primary trainers. 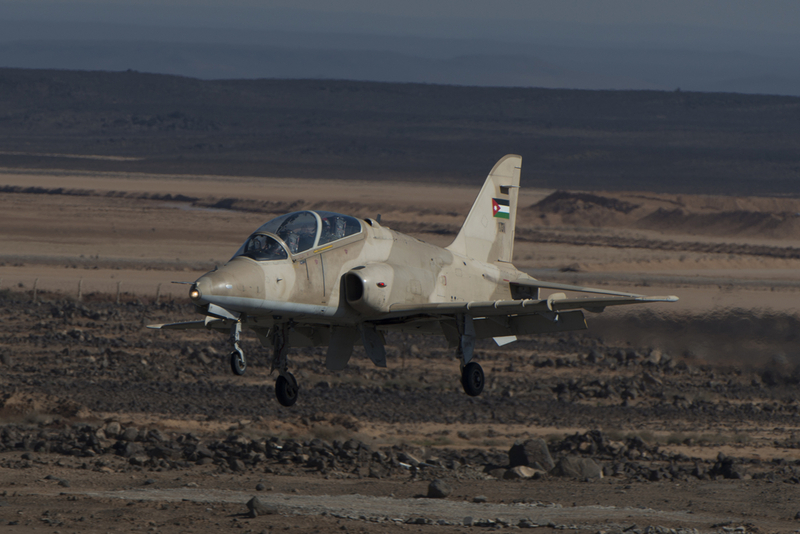 In exchange programs, the KHAC also trains pilots from Pakistan, Kenya and other countries. 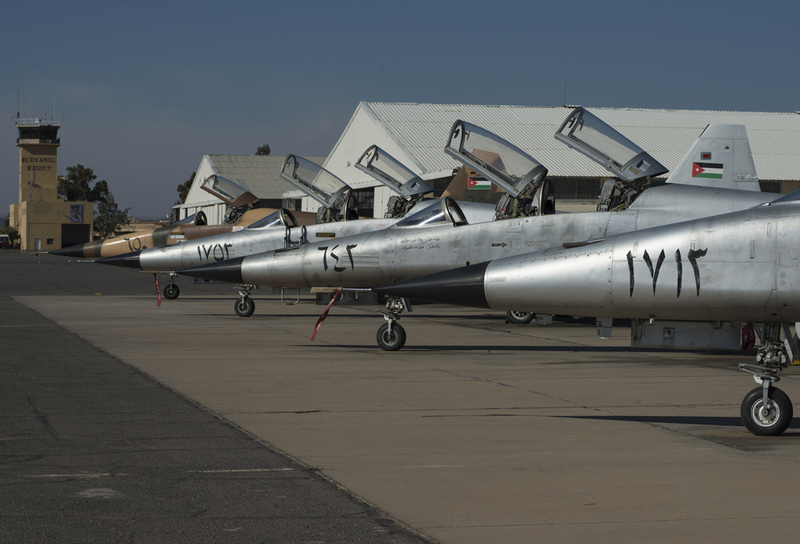 The Instructor Pilot School operates eight former British T-67M-260 Firefly aircraft that are even still showing their civilian registration. 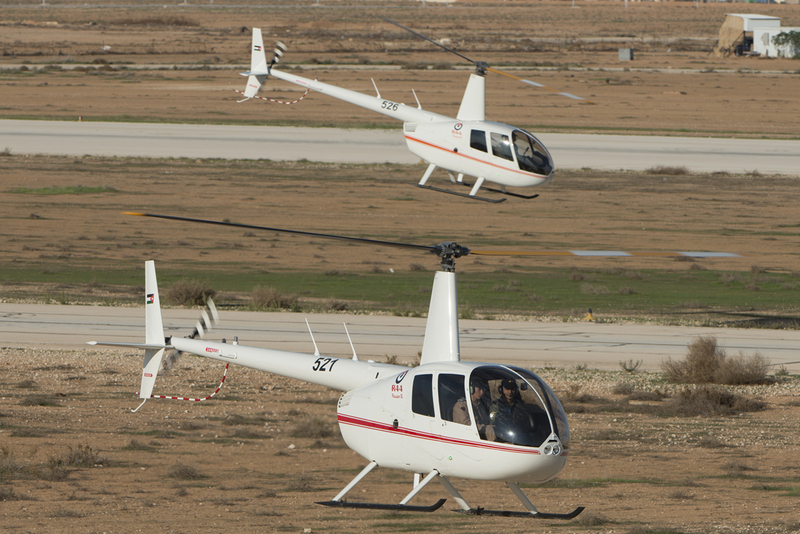 Since the delivery of the Robinson R44 Raven II, the AS350B3 Ecureuil helicopters were transferred from 5 Squadron to the Instructor Pilot School. 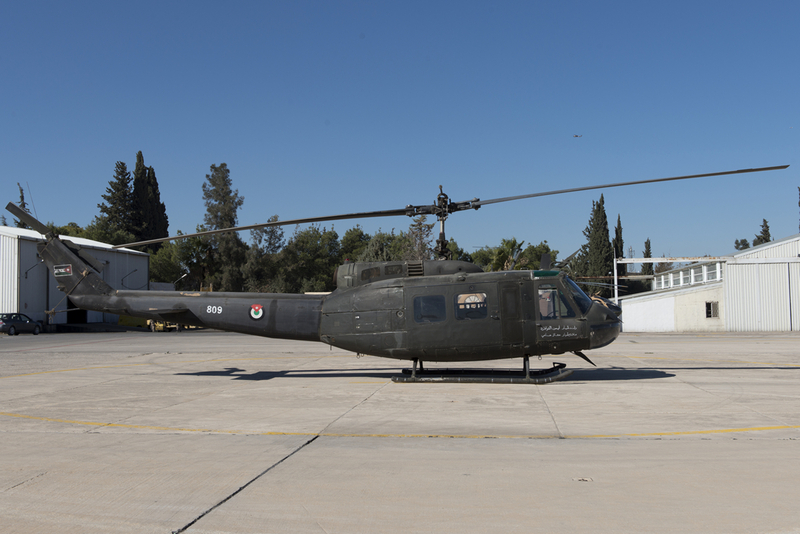 This means that basic and advanced training for helicopter pilots is now performed on the Raven II. Eight Robinson R44 Raven II helicopters are operated by 5 Squadron. 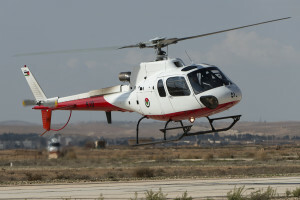 They replaced the Hughes H500D and H500E helicopters in the basic helicopter training role. 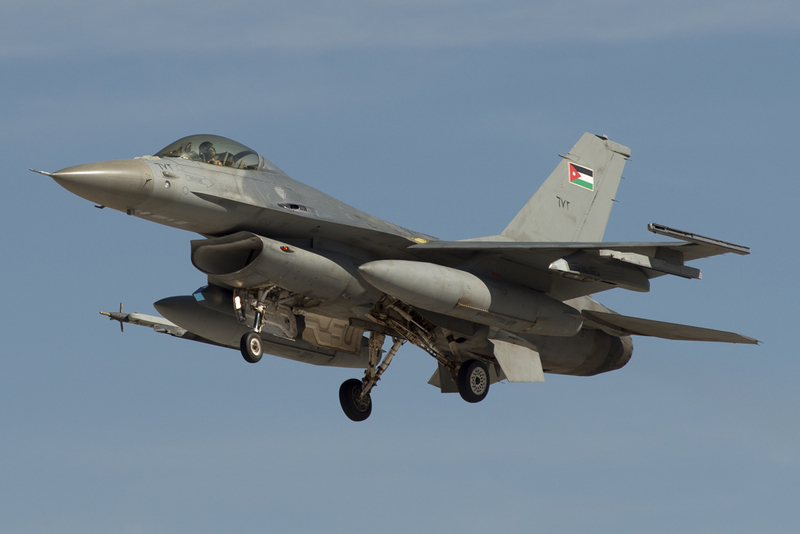 The primary strike capability is delivered by the F-16AM and F-16BM fleet operated by three squadrons that are now concentrated at Shaheed Muwaffaq Al-Salti (al-Azraq) Air Base. 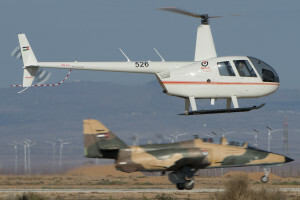 The end of the Huey in RJAF service is very near. 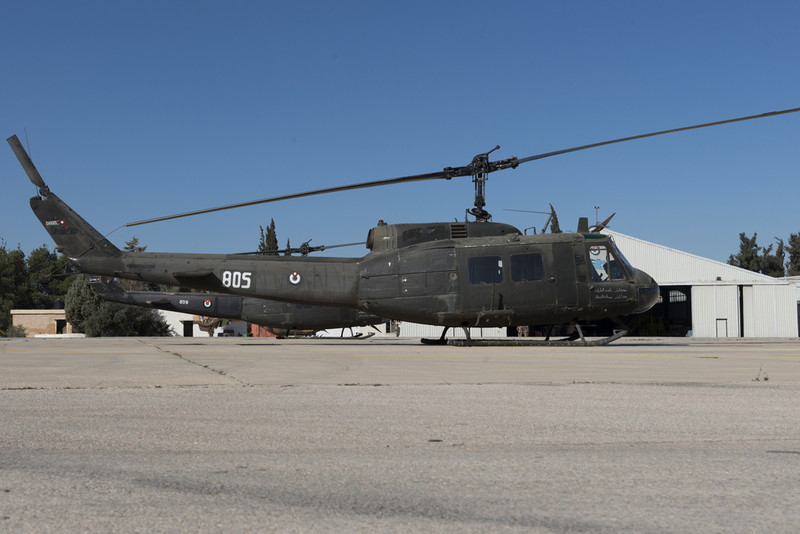 With the delivery of extra Black Hawk helicopters to 8 Squadron, more and more UH-1Hs are stored at Amman-Marka. Only a handful are considered to be operational. 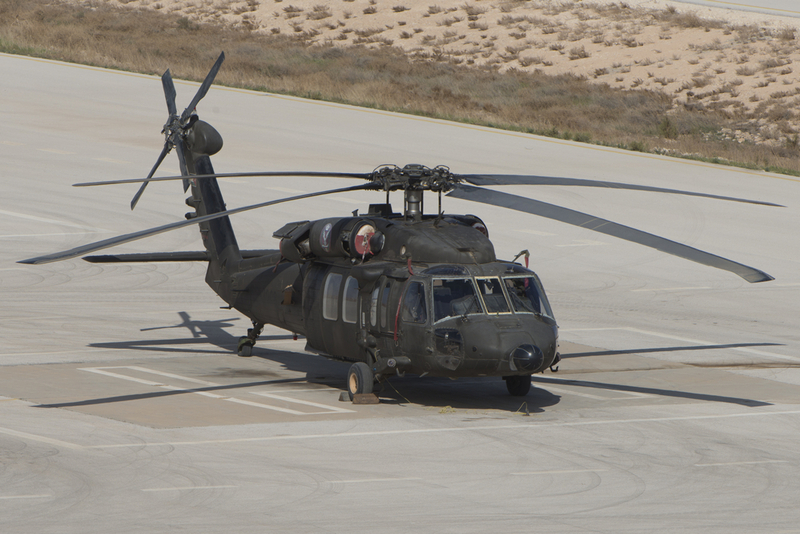 Some ex Royal Sq Black Hawk helicopters were transferred to 8 Squadron and they were augmented by a mix of UH-60A and S-70A Black Hawks of the U.S. Army. The Black Hawks will form the backbone of a Quick Reaction Force that is being set up now. 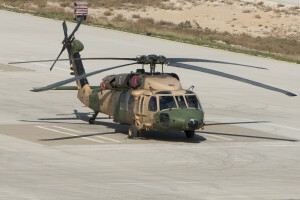 Special Operations Command (SOCOM) 30 Squadron operates eight UH-60L Black Hawk helicopters from King Abdullah II Air Base. 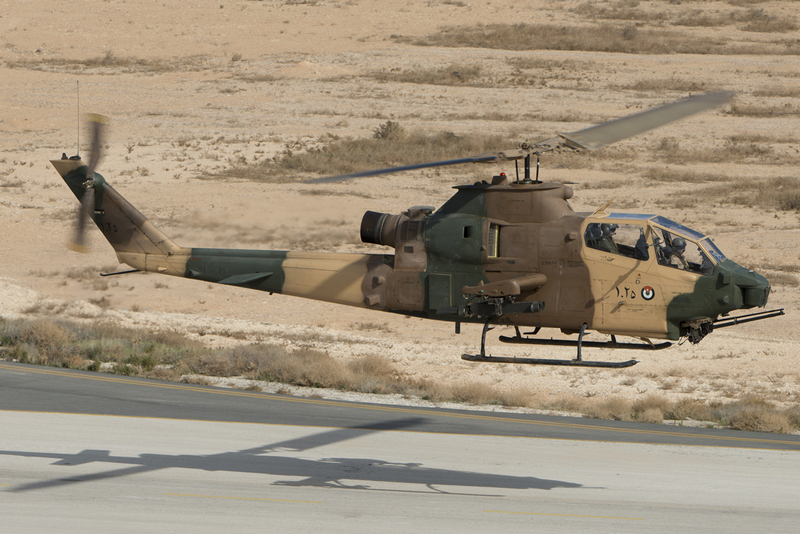 Seven of them are in a very attractive sand colour scheme while one is in a very dark green scheme, applicable for night operations. 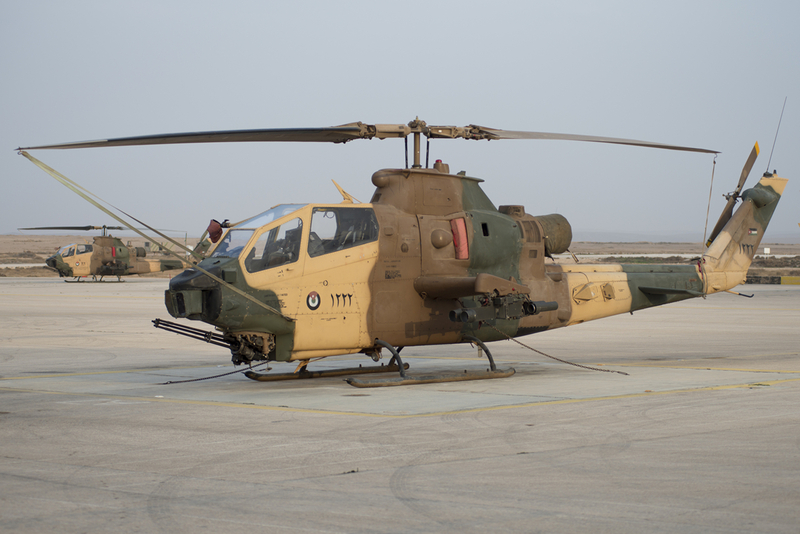 Eight MD530F Little Birds are operated by SOCOM 28 Squadron. 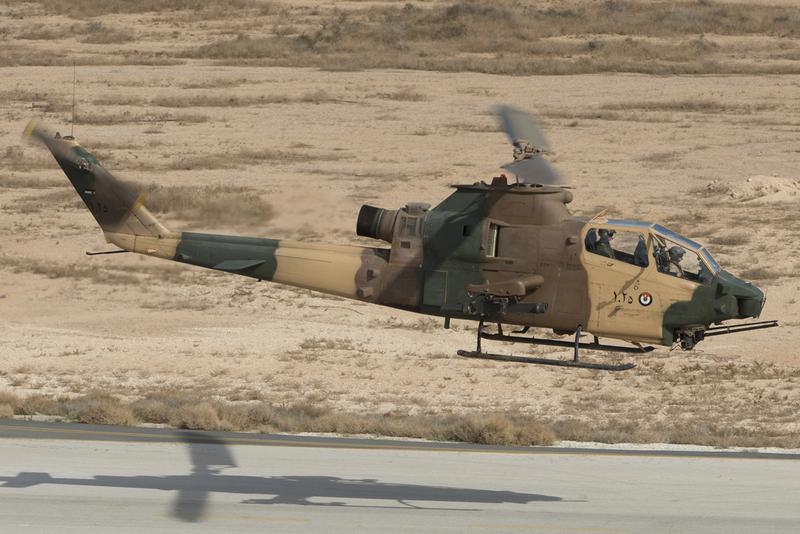 They were delivered in late 2006 and as with the Black Hawks, some are in a sand camouflage and some are in a dark colour scheme. 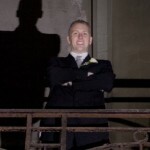 Patrick Roegies is born and raised in Tilburg, the Netherlands and currently resides in Sittard in the south of the Netherlands where he lives with his wife Joyce. Patrick graduated from a technical study at the HTS in Tilburg in 1997. He currently works as a head of an equipment engineering department in the south of the Netherlands. His passion towards aviation started at the age of 7 in 1977 when his father took him to nearby Gilze Rijen Air Force base where he witnessed his first howling F-104 Starfighters which were practicing and as a result he got addicted immediately. The F-104’s were present in order to determine a tactic to create a diversion for the "train highjack" which was going on in the Netherlands at that time. The F-104's were meant to create a diversion by performing an overshoot, kicking in the afterburner directly over the train, creating confusion with the hijackers and enabling the police to master the hijackers. This action has actually been performed and worked. This is when his passion towards aviation was born. He got permission from his parents to visit the airbase every free hour he had and his father showed him the way by bicycle. Patrick got his first camera in 1984 which was a Canon T50 and shot Kodachrome 64 slides of mainly military aircraft. He changed his gear in the mid-nineties to Nikon and is a Nikon user ever since. When Patrick obtained his driver license in 1989 he started to visit airbases all over Europe and from 1997 onwards he made worldwide visits to military airbases. In order to further professionalize his work as an aviation photographer and journalist he started to write military aviation related articles based upon his visits to various nations and their Air Forces. He managed to publish his first article in 2003 and increased the numbers of publications every year.